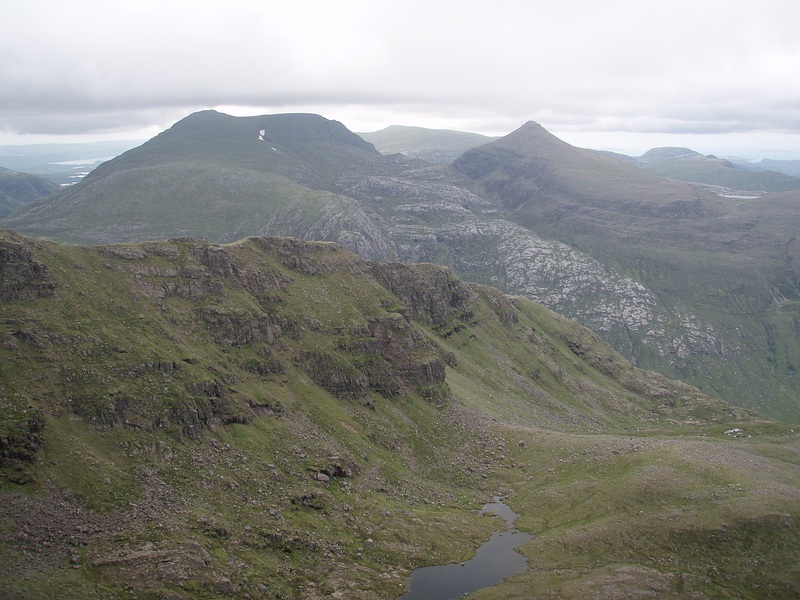 On my first round of the Fisherfield Munros in April 2009 I had climbed all six with a big pack, walking in and camping by the Abhainn Loch an Nid opposite Beinn a’ Chlaidheimh on day one, and climbing the first four Munros followed by a camp on the lower SE slopes of A’ Mhaighdean on day two. 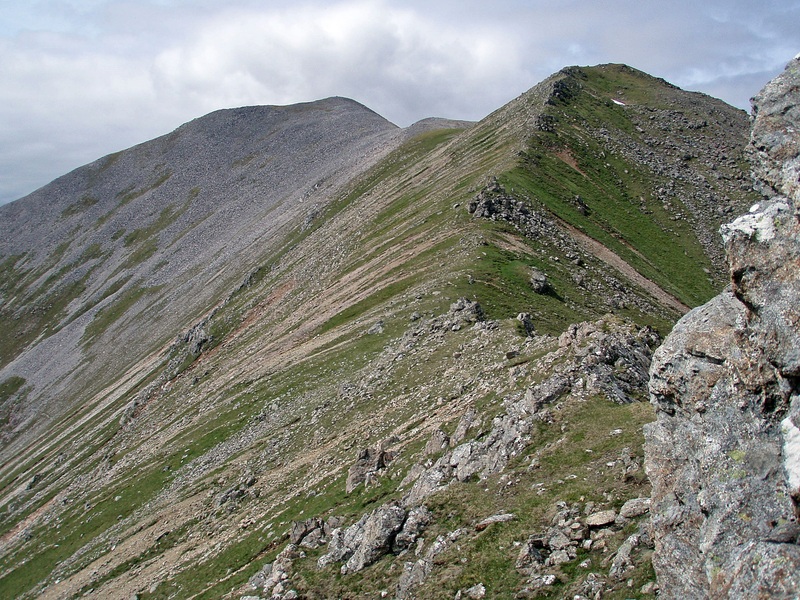 The next day my legs had felt like jelly and I had found the route over the last two Munros and the walk out to Corrie Hallie very strenuous. This time I wanted to do the round without the camping gear, but even when based in Shenavall or camping nearby it is still a very long day and I didn’t think I would have the stamina for that. 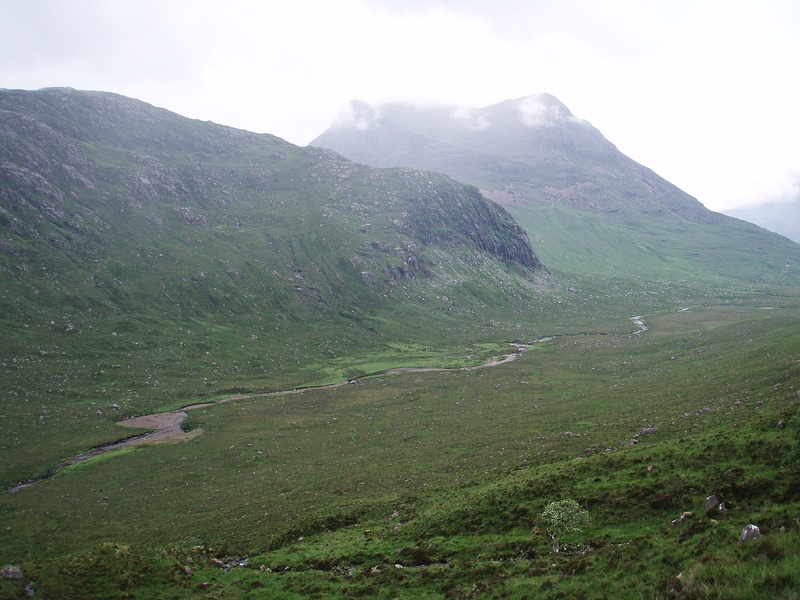 After studying the map I came up with the idea of a base right in the centre of my planned hills, at the head of Gleann na Muice (I was going to give Beinn a’ Chlaidheimh a miss this time as it had been demoted back to Corbett status in 2012). I had been wondering if I would find a parking space at Corrie Hallie, but when I arrived at 17:45 there were only a few cars parked in the lay-by. 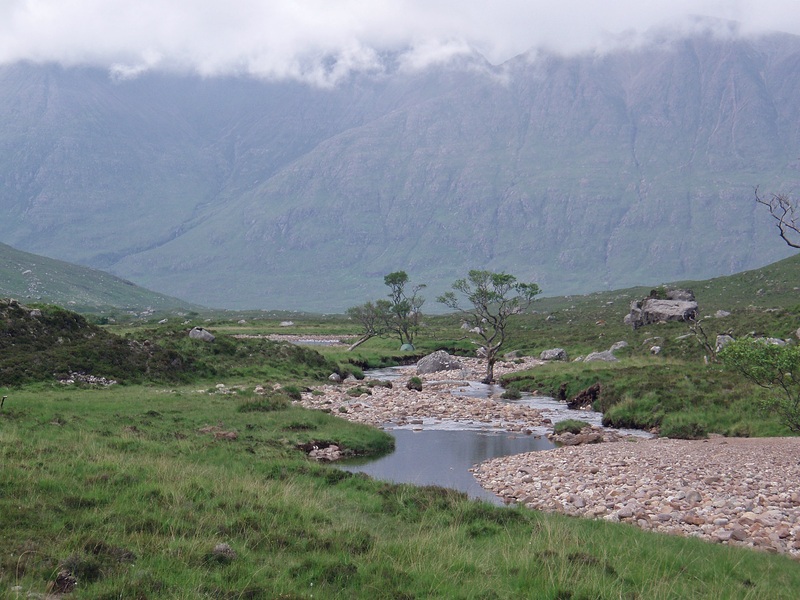 The weather was pleasant for walking, but most of An Teallach’s ridge was under low clouds, only Sàil Liath was clear. 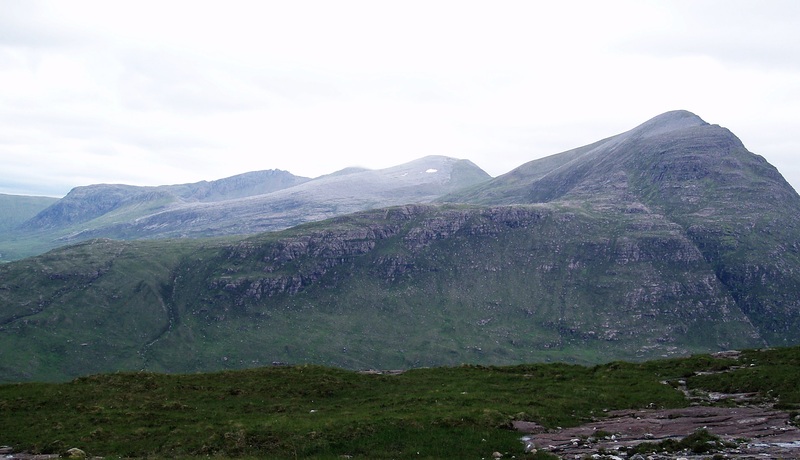 Beinn a’ Chlaidheimh with the first two of tomorrow’s hills behind it, Sgùrr Bàn and Mullach Coire Mhic Fhearchair. Strath na Sealga. 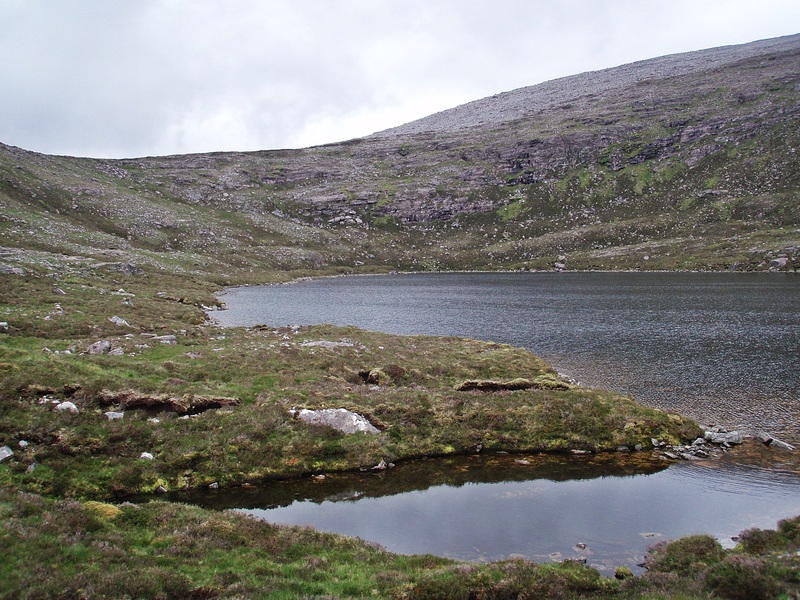 Loch na Sealga. 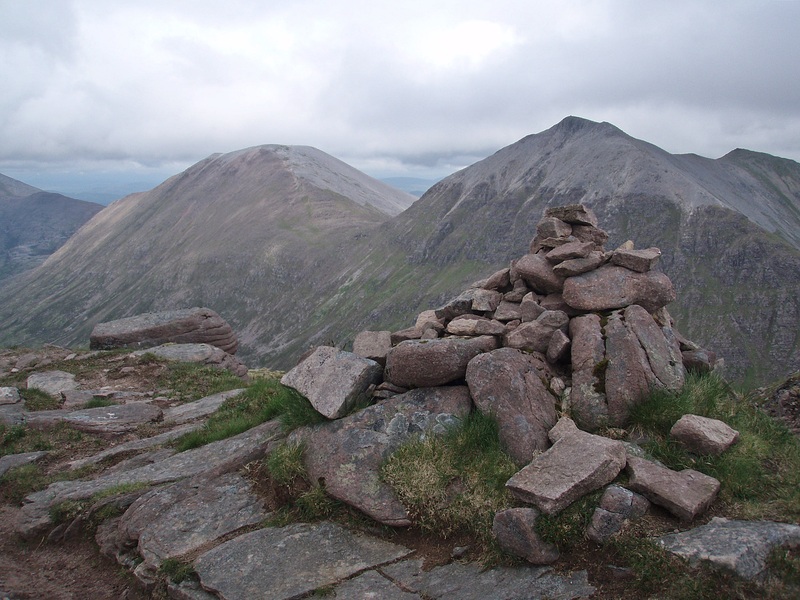 Beinn Dearg Mòr. 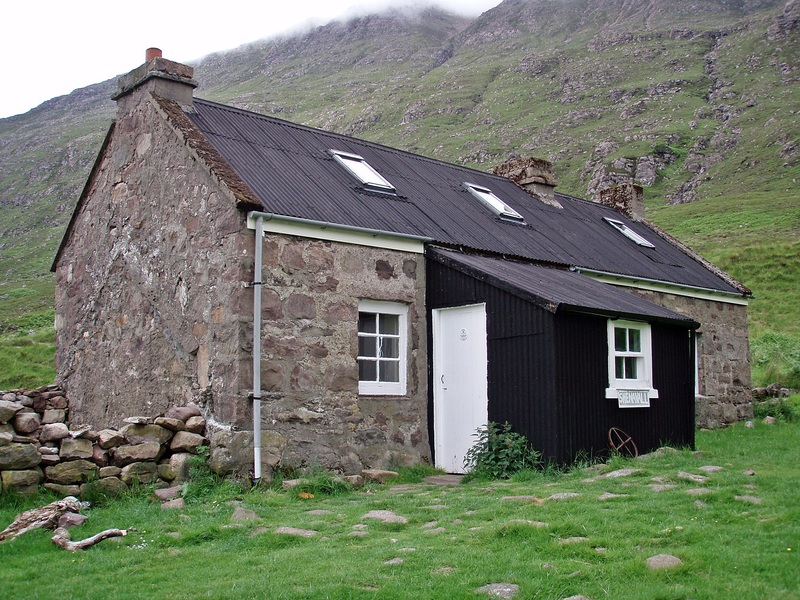 I didn’t have time to have a look inside Shenavall Bothy as I wanted to find a camp site before dark, but I would stop for a break on the walk out in two days’ time. 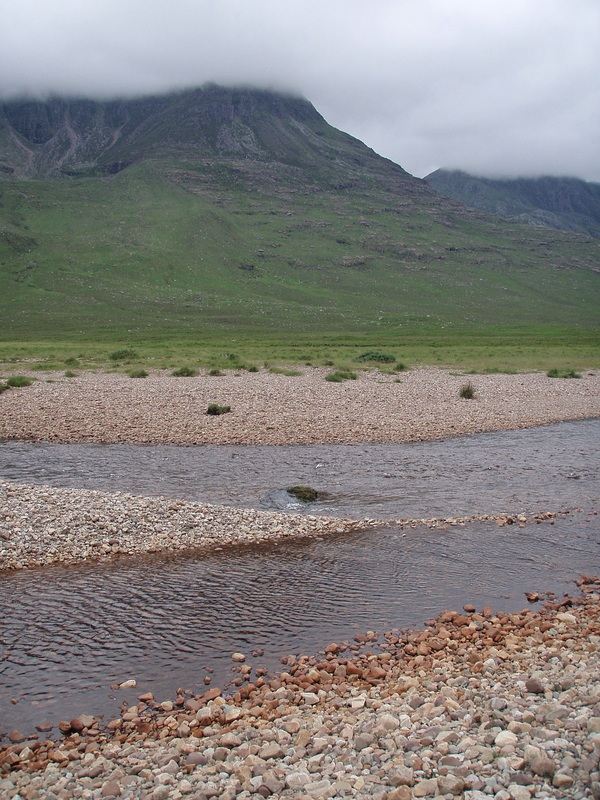 At 20:30 I reached the Abhainn Srath na Sealga, waded across in Crocs and kept them on until I had forded the Abhainn Gleann na Muice as well. The water levels on both rivers were very low and didn’t cause any problems, but when I sat down near Larachantivore to change from Crocs back into boots I had to fight off the midges. 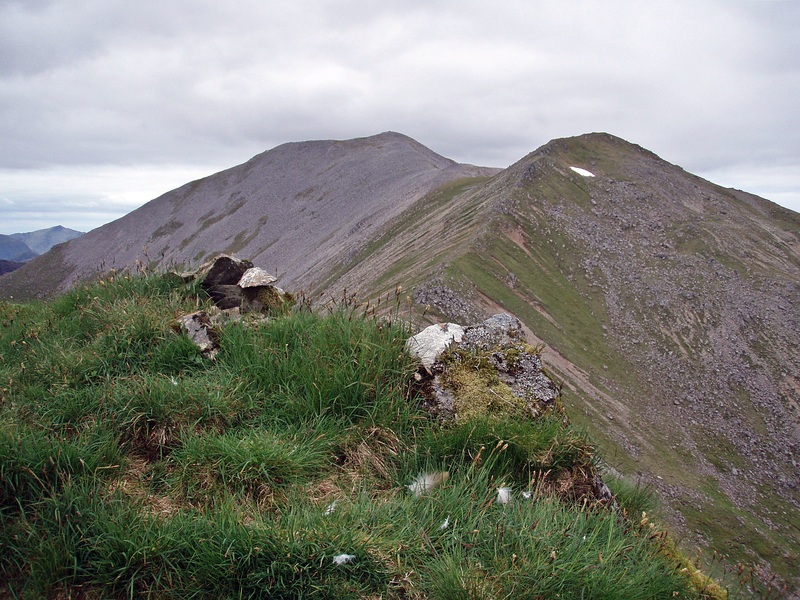 Beinn Dearg Mòr. At the junction of glens further upstream I took the left turn for the first time and headed into Gleann na Muice. 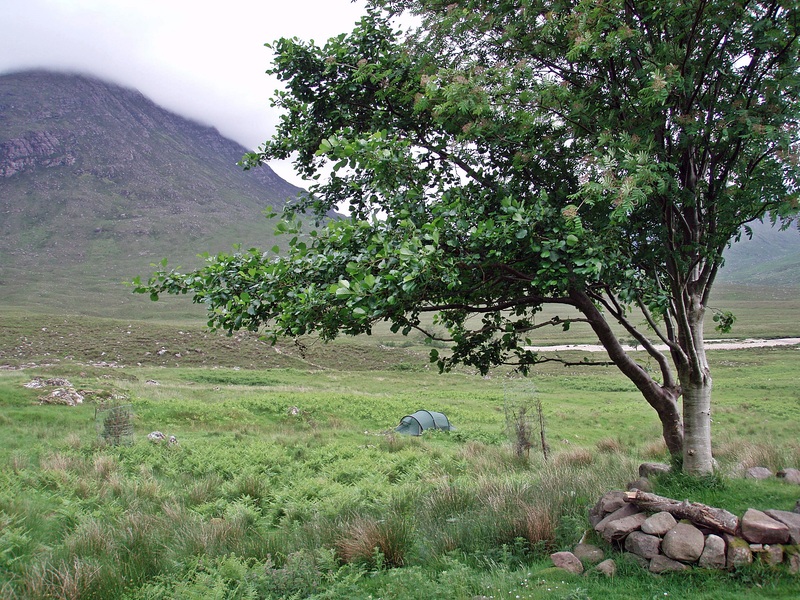 Shortly after 22:00 I found a place to camp on the W bank of the Abhainn Gleann na Muice, right beside the path which wasn’t ideal as I was going to stay there for two nights but I didn’t expect many walkers, if any, to pass this way the next day. My camp site in the morning. 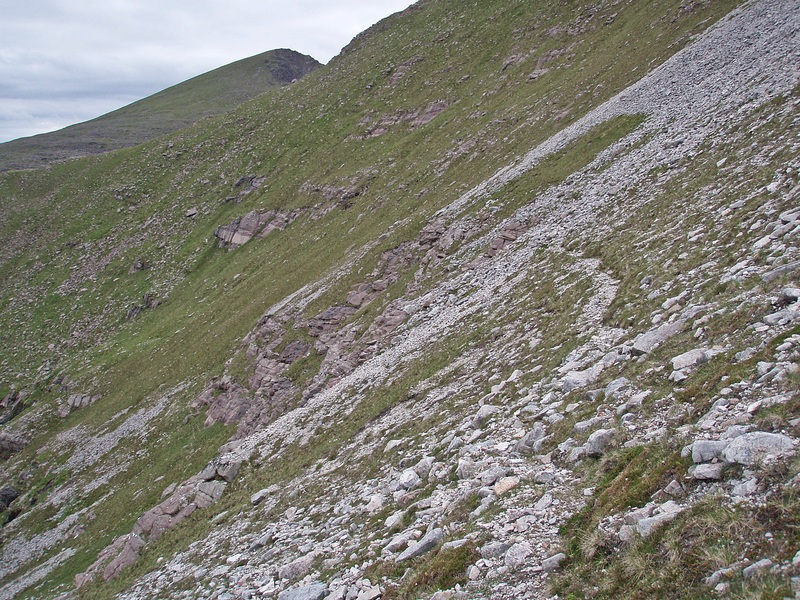 Ascent route by the Allt Loch a’ Bhrisidh. 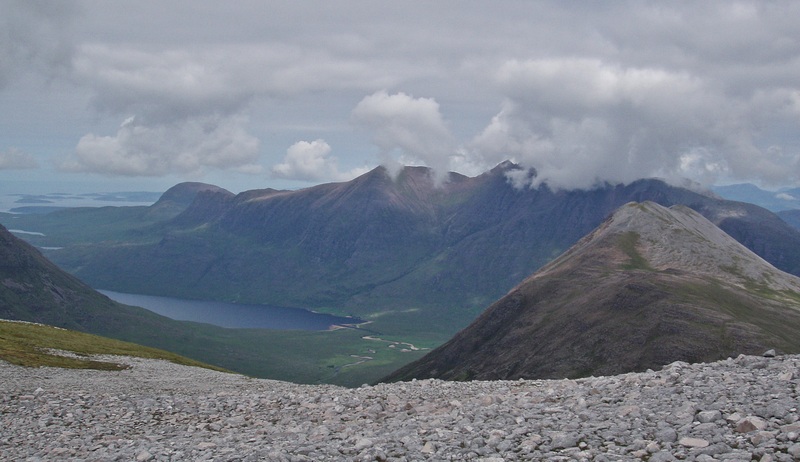 Looking down to Gleann na Muice. The weather was warm, humid and windless, and there was even some drizzle while I made my way up the grassy slopes. 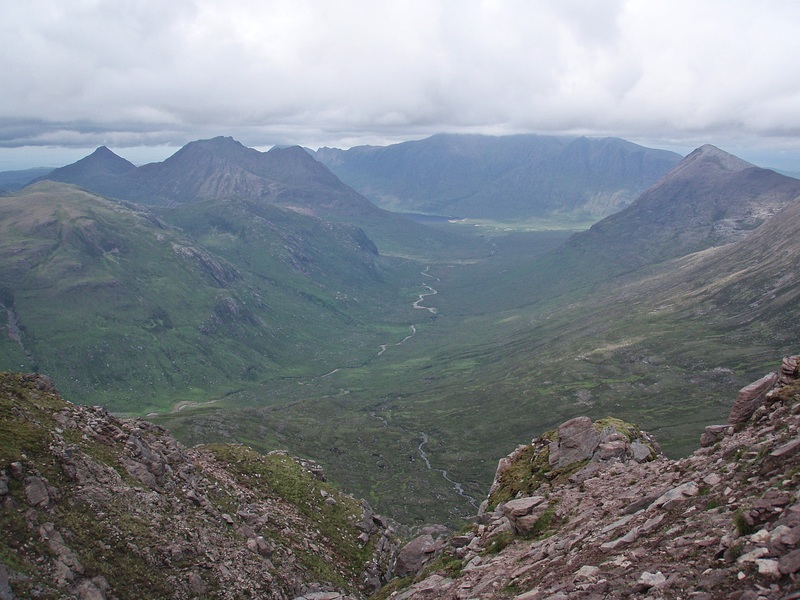 The midges were bothering me as well, and for some reason this ascent seemed like an endless slog. 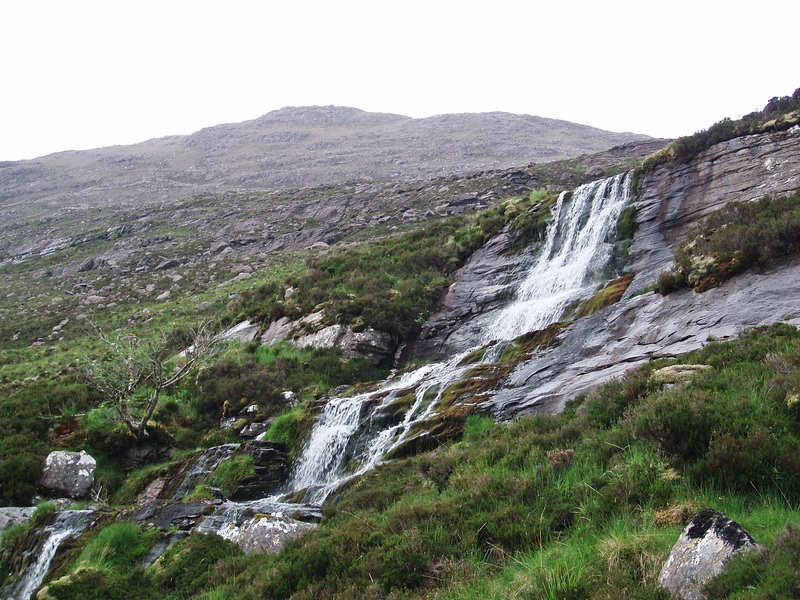 Another waterfall on the Allt Loch a’ Bhrisidh. 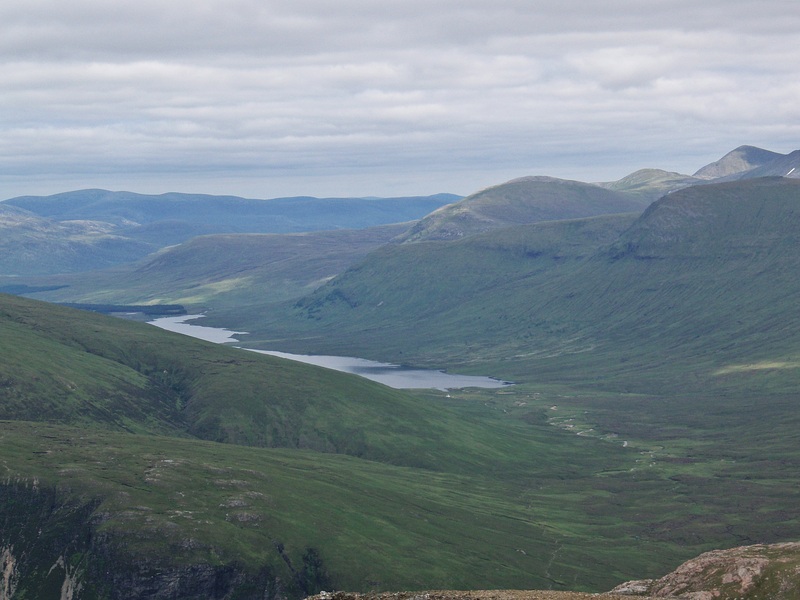 Because I had made such incredibly slow progress, it was already 10:45 when I reached the bealach between Beinn a’ Chlaidheimh and Sgùrr Bàn. 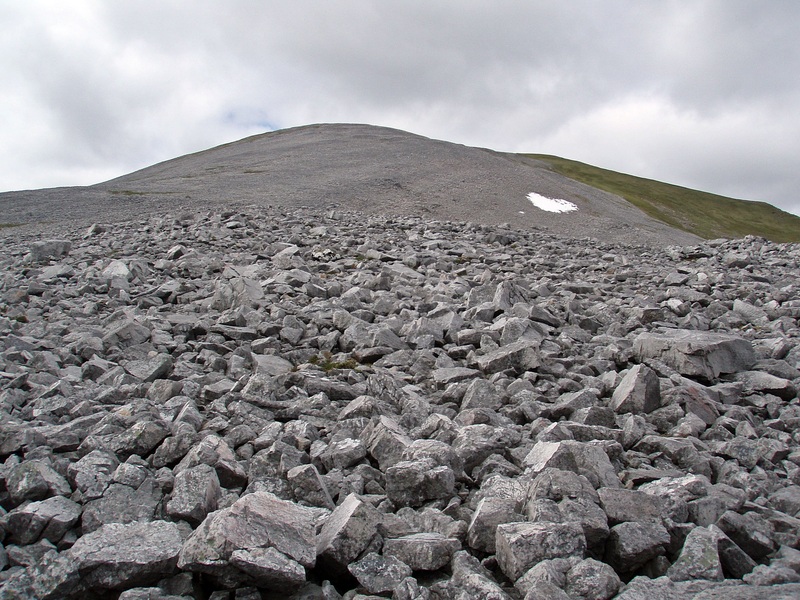 The boulder field leading to the summit of Sgùrr Bàn. 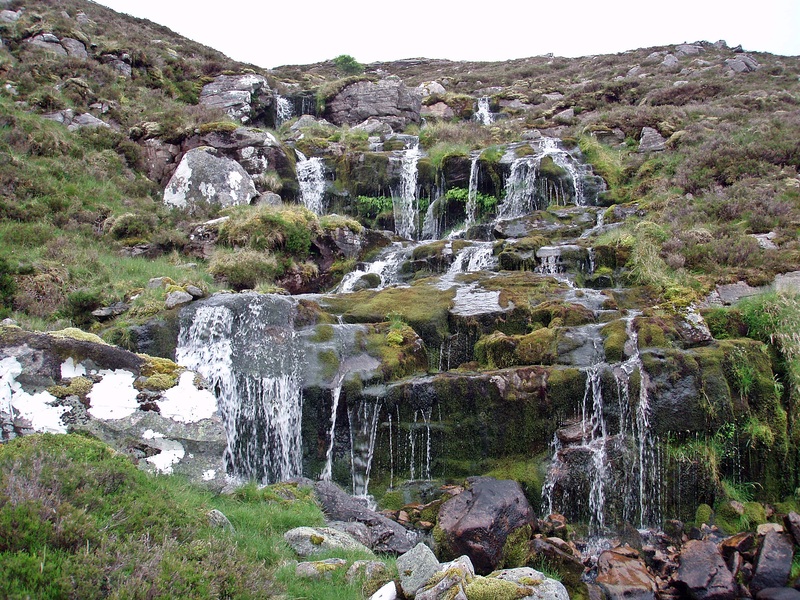 Howff on the lower slopes of Sgùrr Bàn. 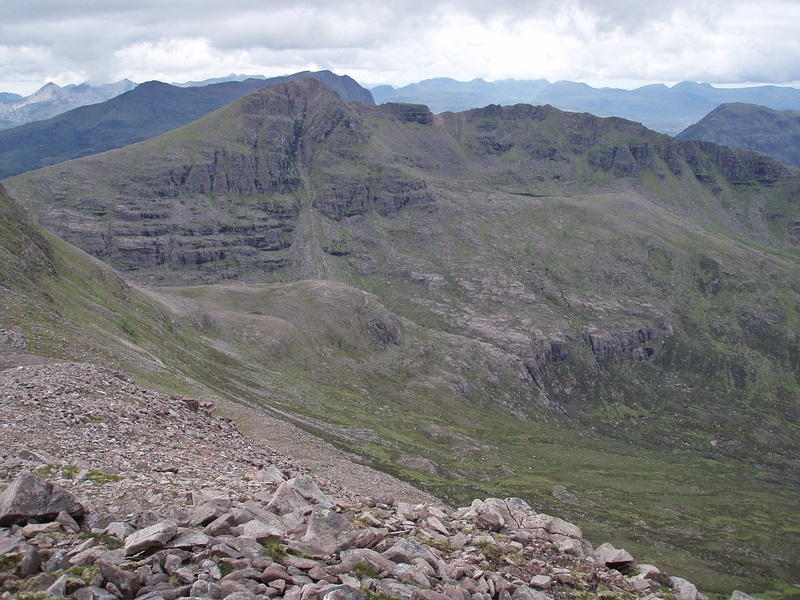 An Teallach (“The Forge”) living up to its name! 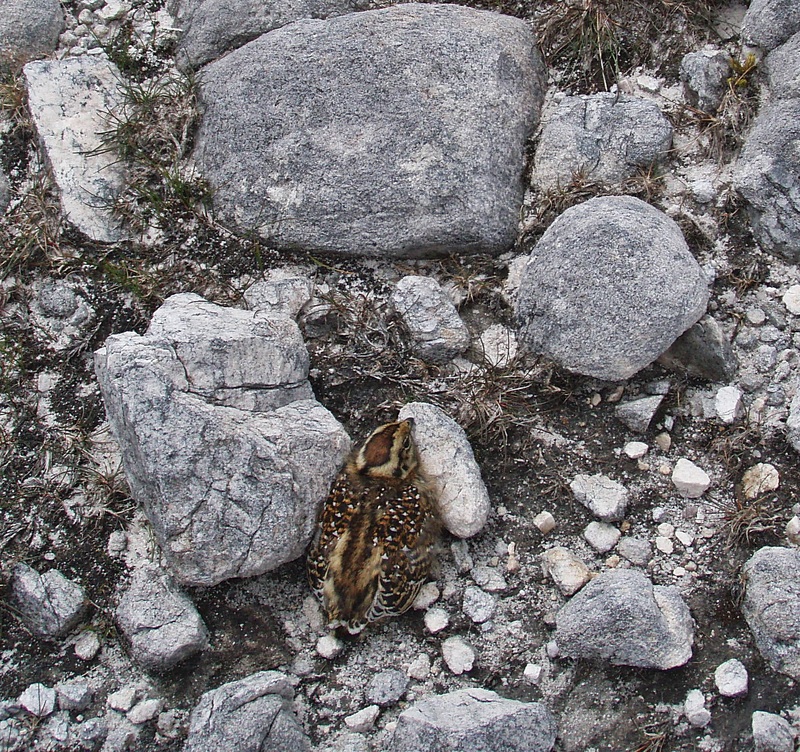 When I reached the vast summit plateau, I almost stepped on this Ptarmigan chick. After taking this photo I quickly moved away so it could be reunited with its mother who was nearby. 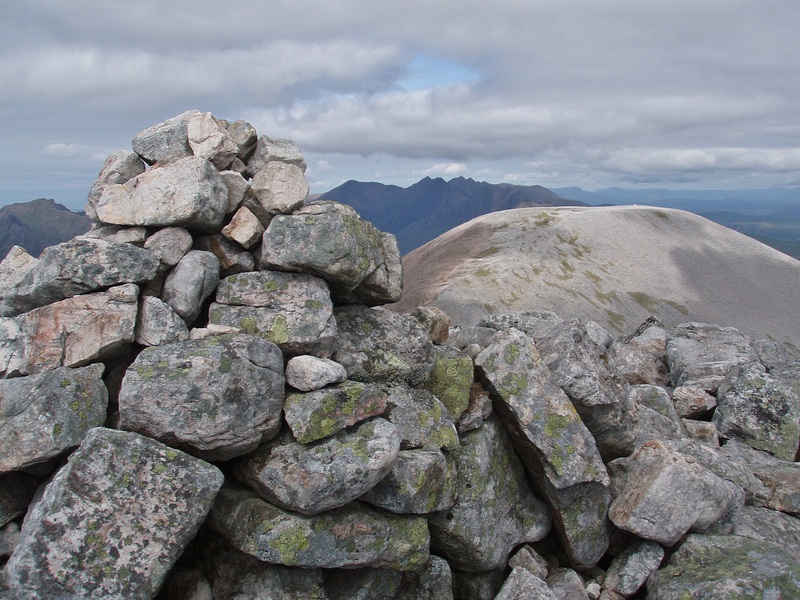 Sgùrr Dubh, the rocky Munro Top I was most looking forward to. 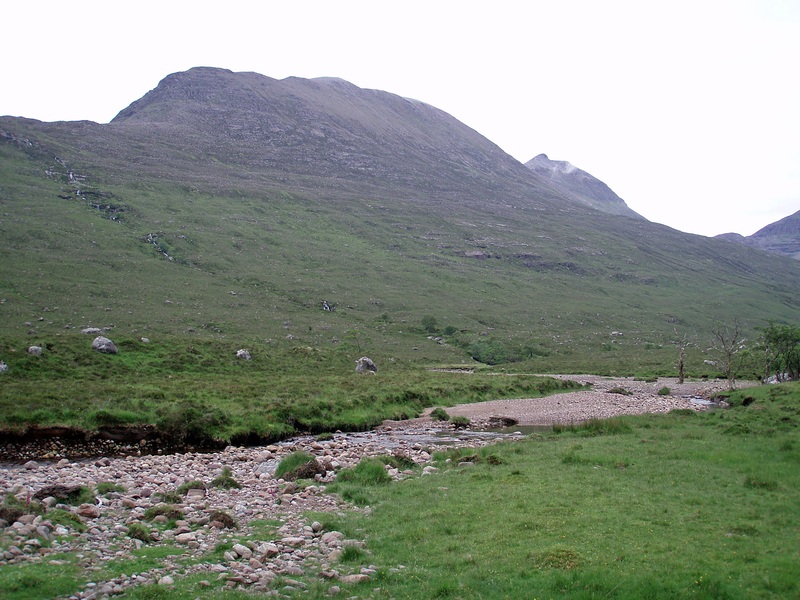 Mullach Coire Mhic Fhearchair with its East Top to the left. 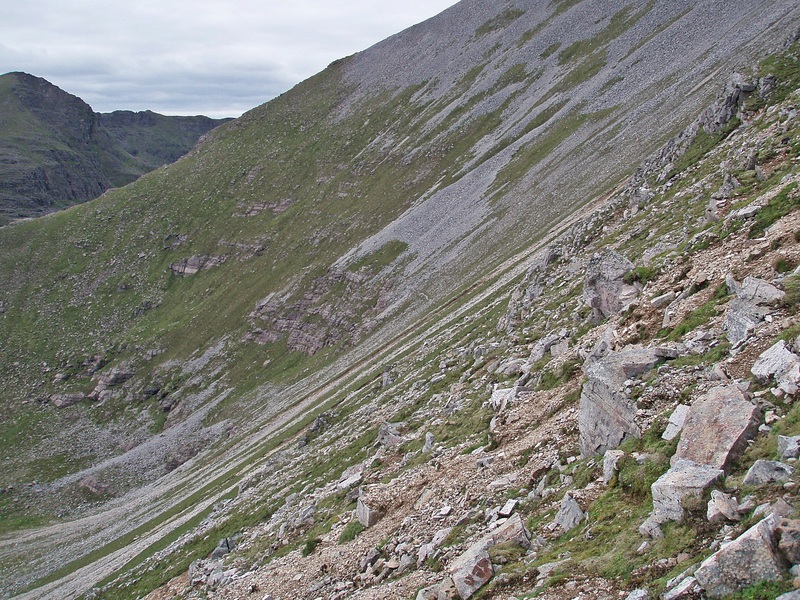 The ascent to Mullach Coire Mhic Fhearchair is on a very steep and loose path which I had found quite hard-going with a full pack when I climbed it the first time, but today with only a light rucksack it seemed a lot easier. Looking down the steep path. 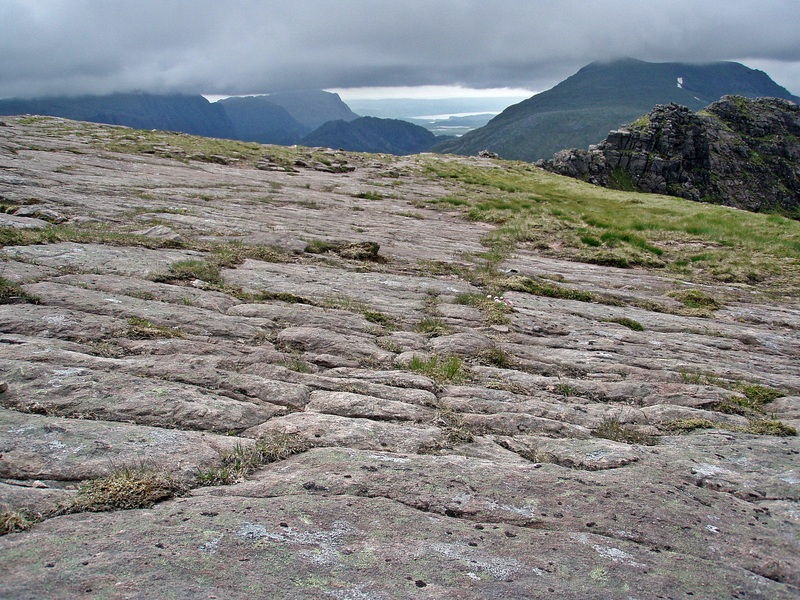 View along the ridge to the E Top. 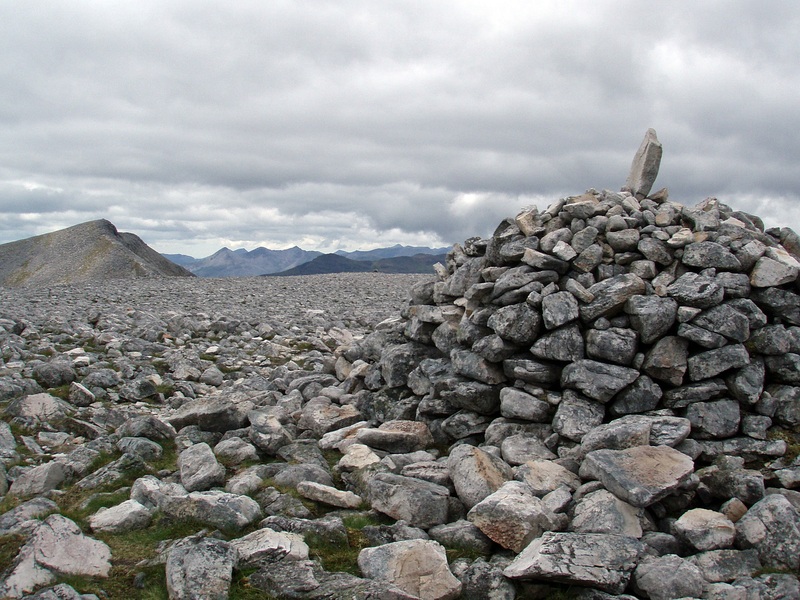 Mullach Coire Mhic Fhearchair summit cairn. 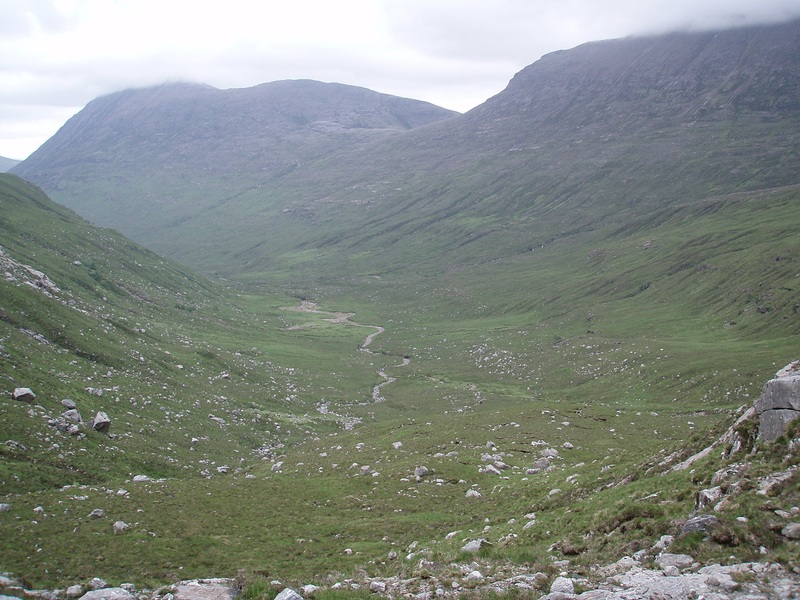 View across the glen to A’ Mhaighdean and Ruadh Stac Mòr – my planned descent route is to the right of Ruadh Stac Mòr, leading down from Lochan a’ Bhràghad to Gleann na Muice. 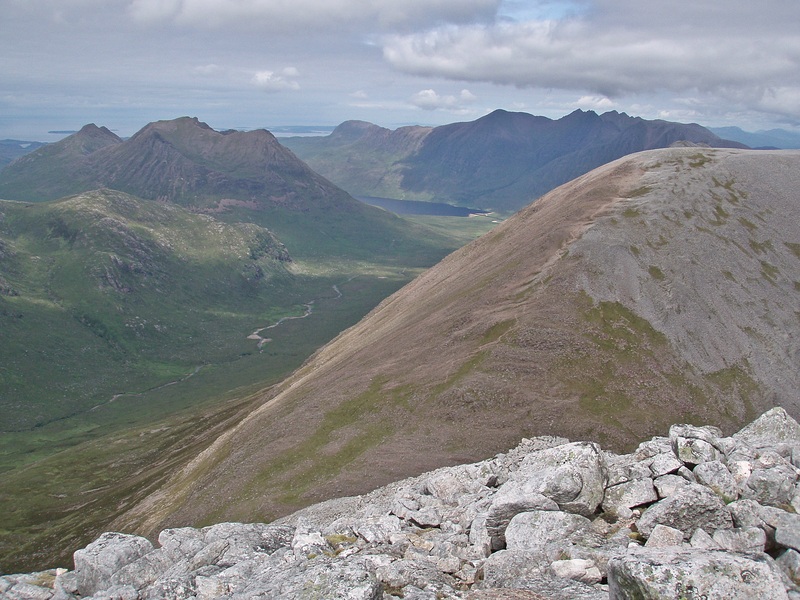 Gleann na Muice with Beinn Dearg Mòr, An Teallach and Beinn a’ Chlaidheimh. 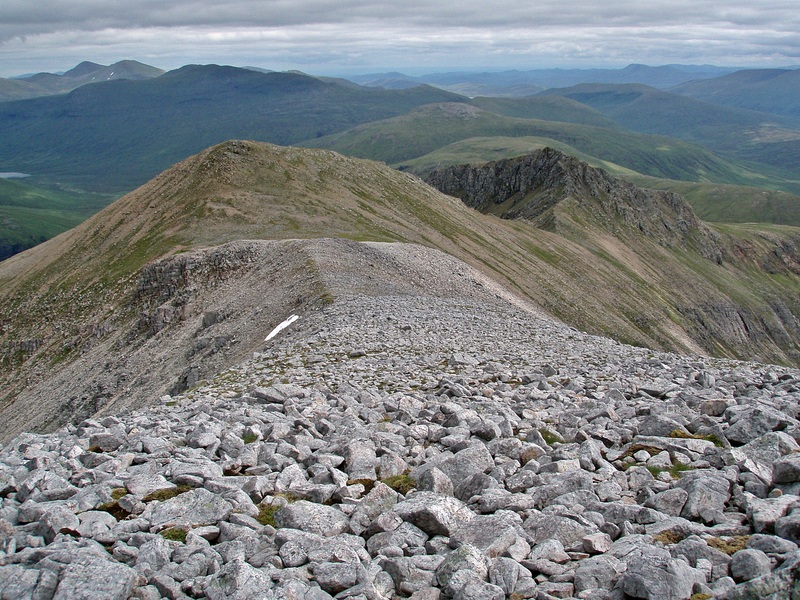 Looking back to Sgùrr Bàn. 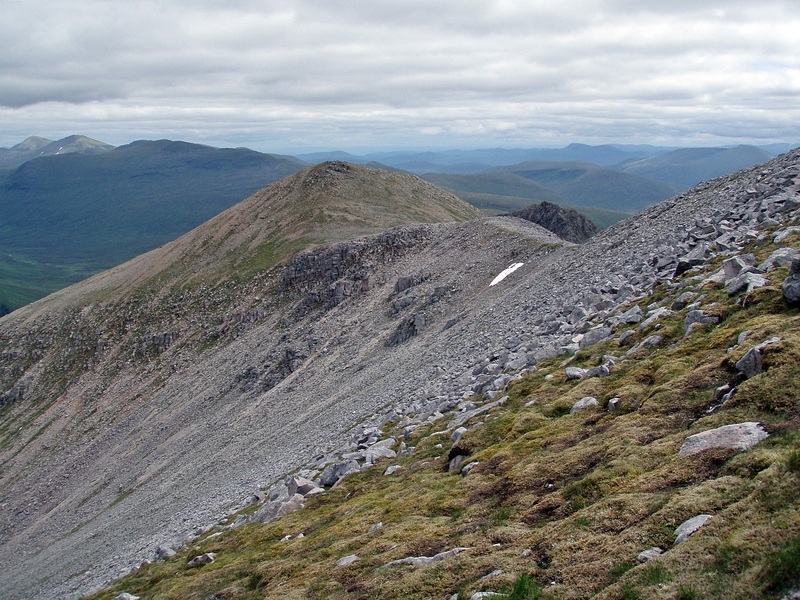 I had hoped for some easier terrain on the way to the two Munro Tops, but the continuation of the E ridge was yet another boulder field. 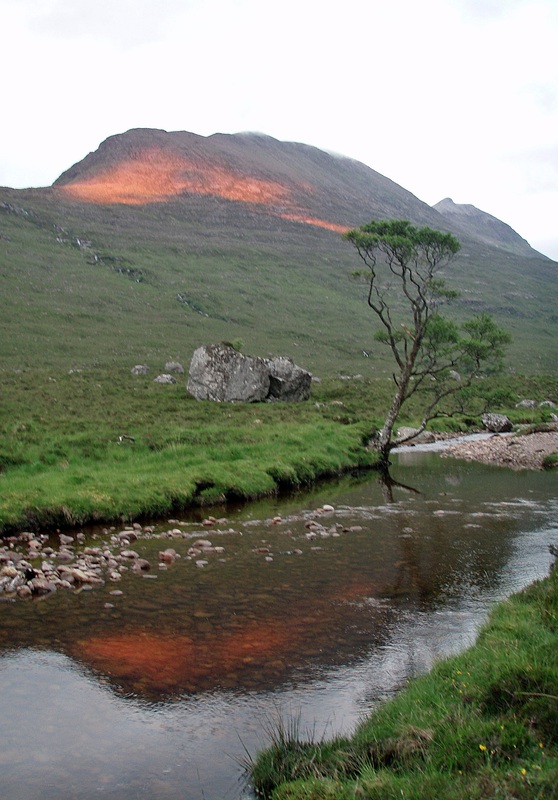 Mullach Coire Mhic Fhearchair’s E Top. 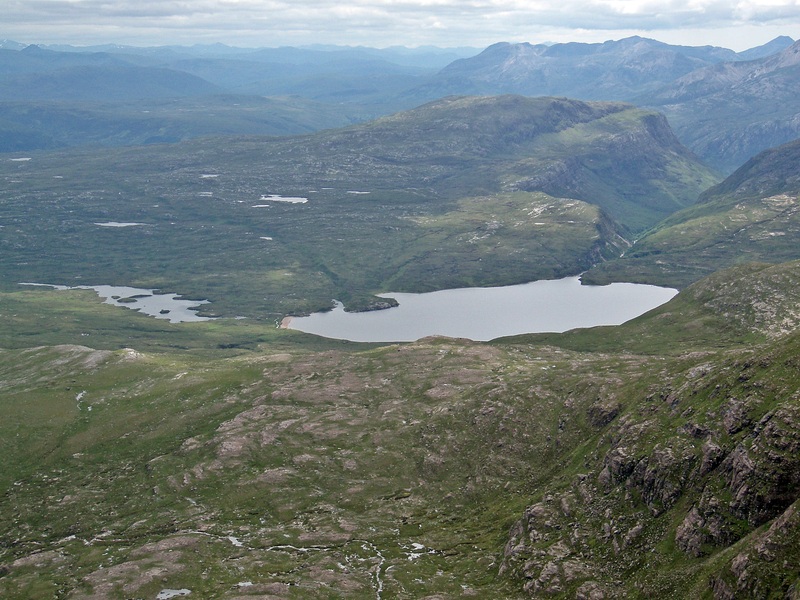 View S to Beinn a’ Mhùinidh and Lochan Fada. 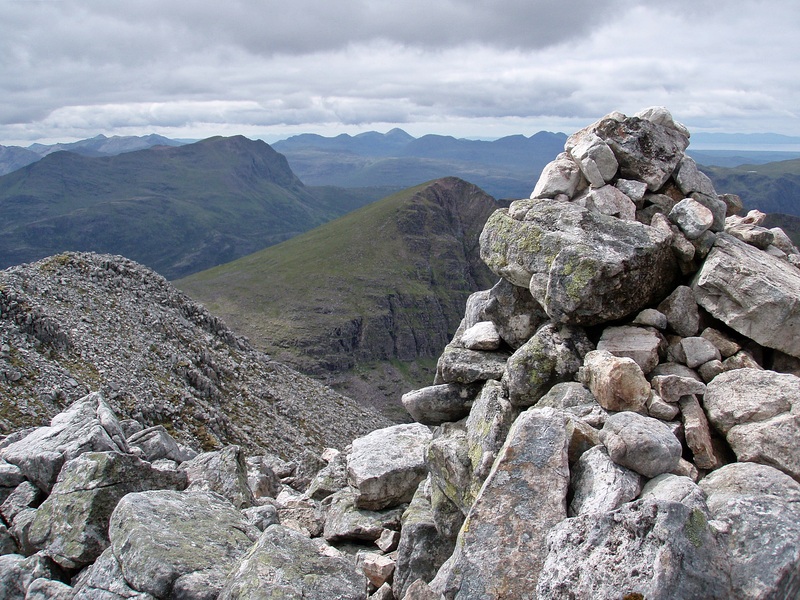 At last I was approaching the most interesting summit of this walk, Sgùrr Dubh. 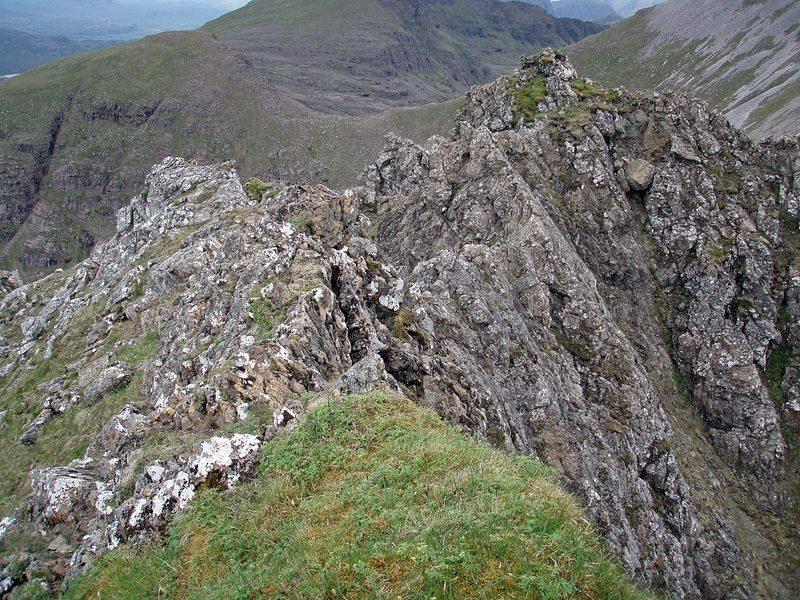 The rocky pinnacles of Sgùrr Dubh. 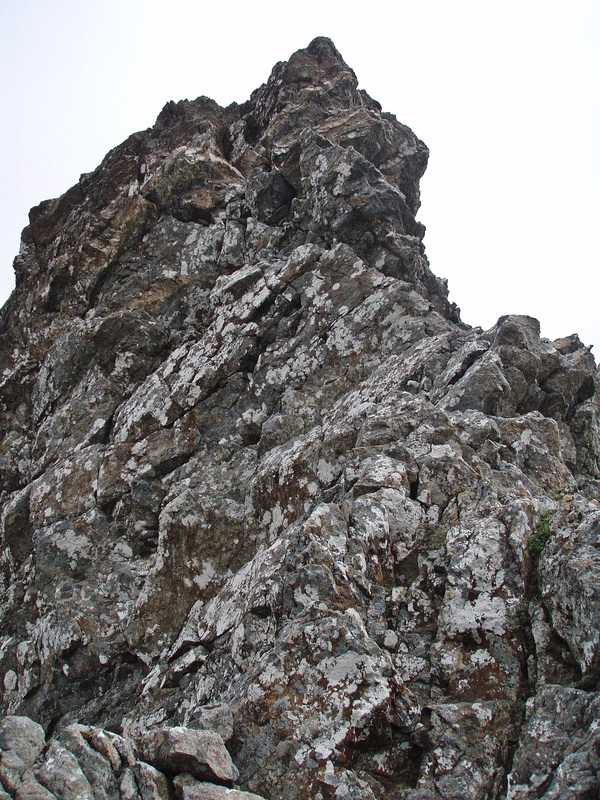 This pinnacle does look a little bit intimidating, but after leaving my rucksack and trekking poles at the bottom I didn’t climb it direct but found an easier way around it on the right. 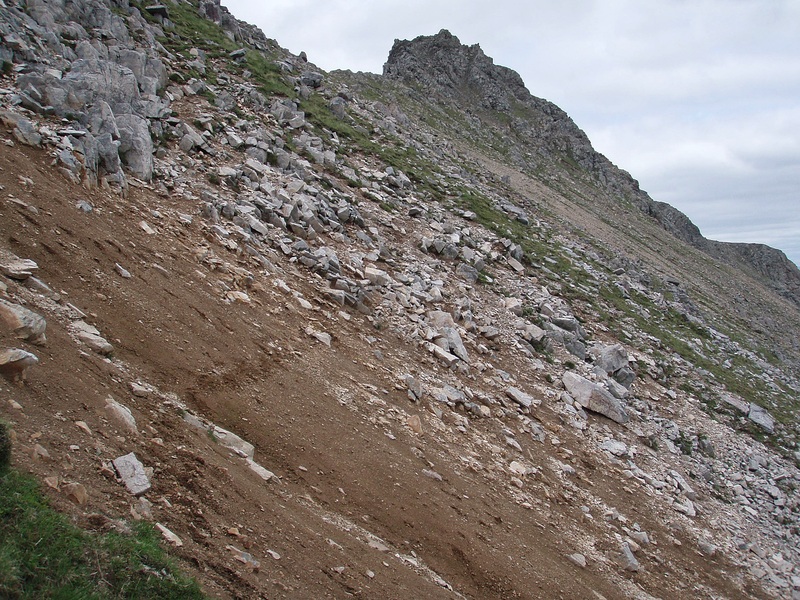 After this obstacle there is a dip with the summit a bit further along a narrow ridge. 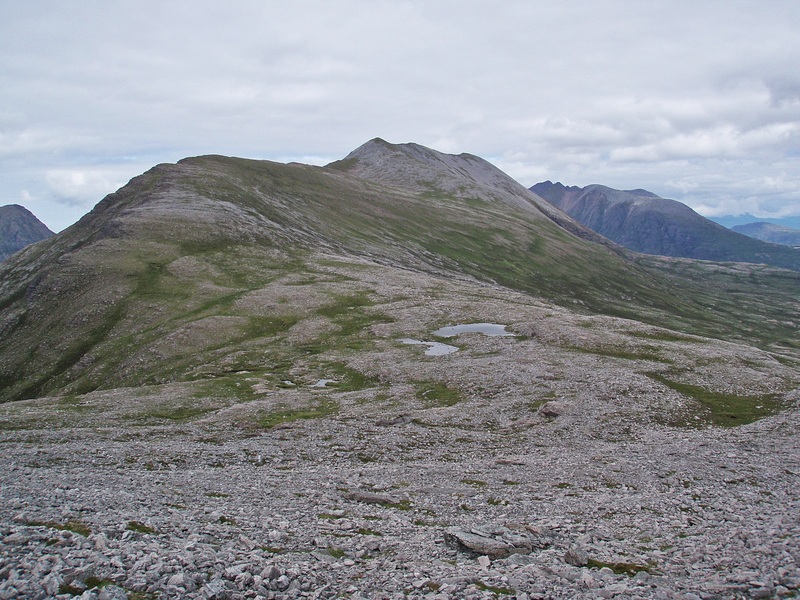 On the tiny summit of Sgùrr Dubh, with Mullach Coire Mhic Fhearchair and its E Top behind. 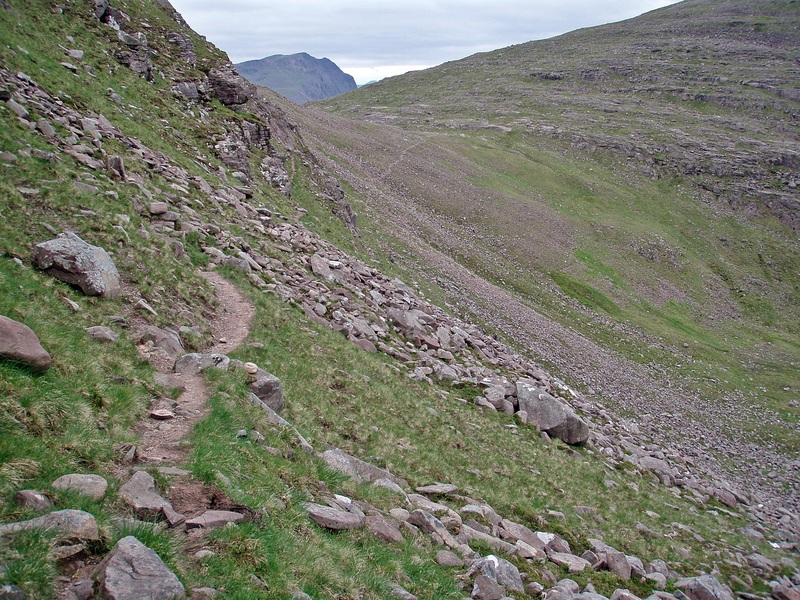 The way back along the narrow ridge. 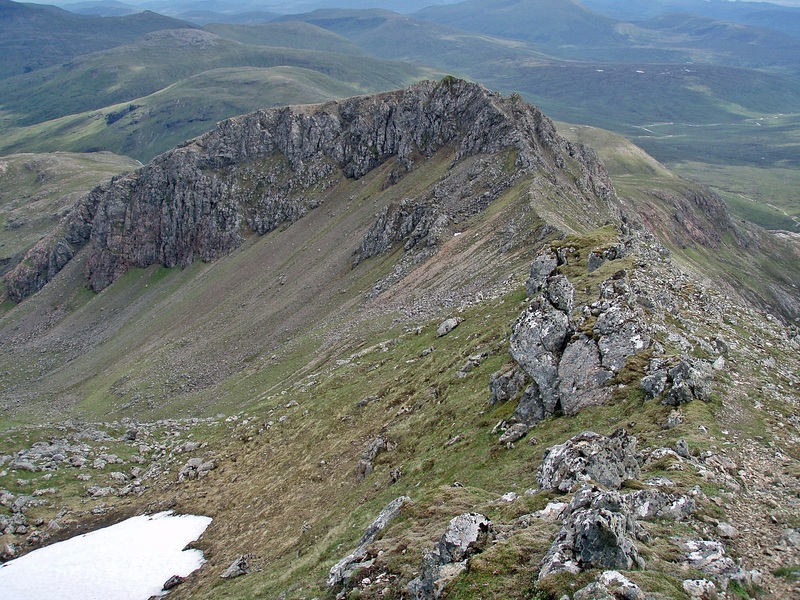 Climbing Sgùrr Dubh was easier than I had expected, because I didn’t climb the crest of the ridge. 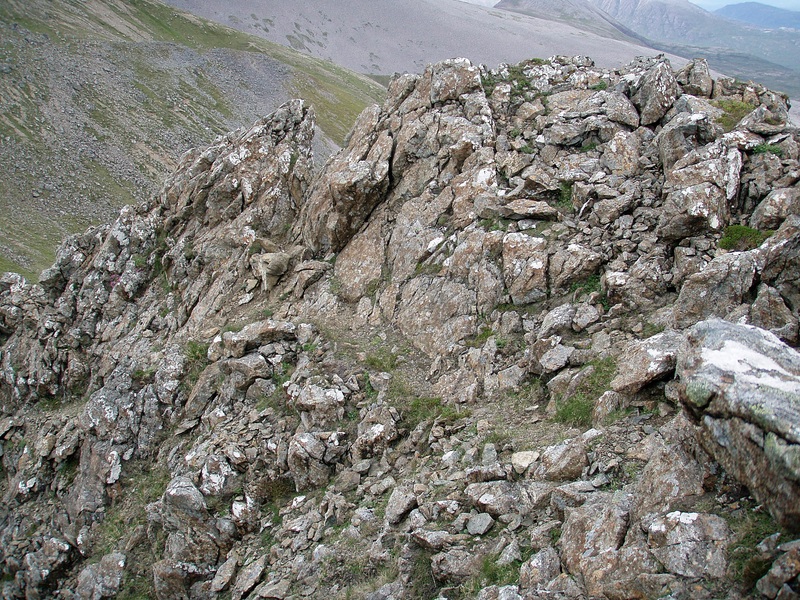 Using the narrow ledges and good handholds on the SW flank of the ridge instead, the scrambling was a lot less exposed. 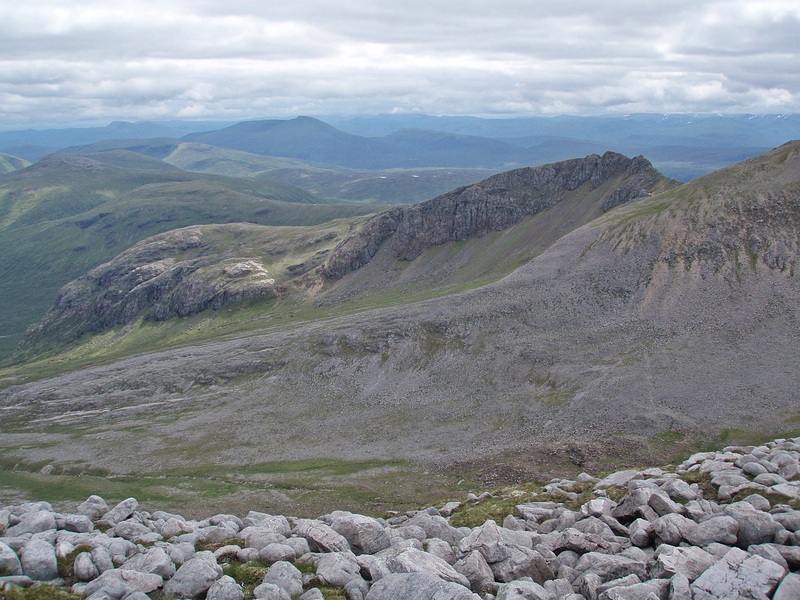 I didn’t fancy climbing Mullach Coire Mhic Fhearchair a second time and decided to contour around Coire Mhic Fhearchair instead. 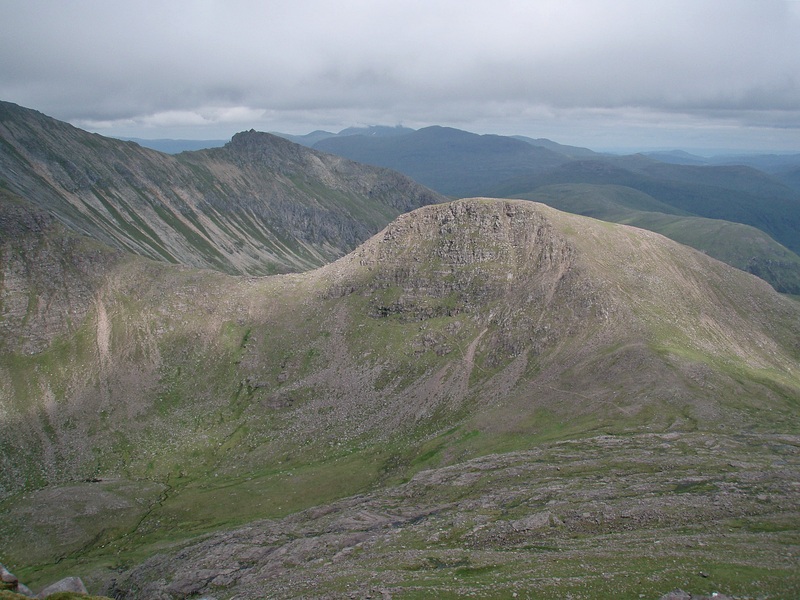 I thought I could make out a faint path above the crags in the centre of the photo, and headed towards it. The terrain was very steep to start with, and in an area where there seemed to have been a landslide I had to kick steps in the firm sand to walk across. When I reached the path I had seen from the distance, the walking became much easier. 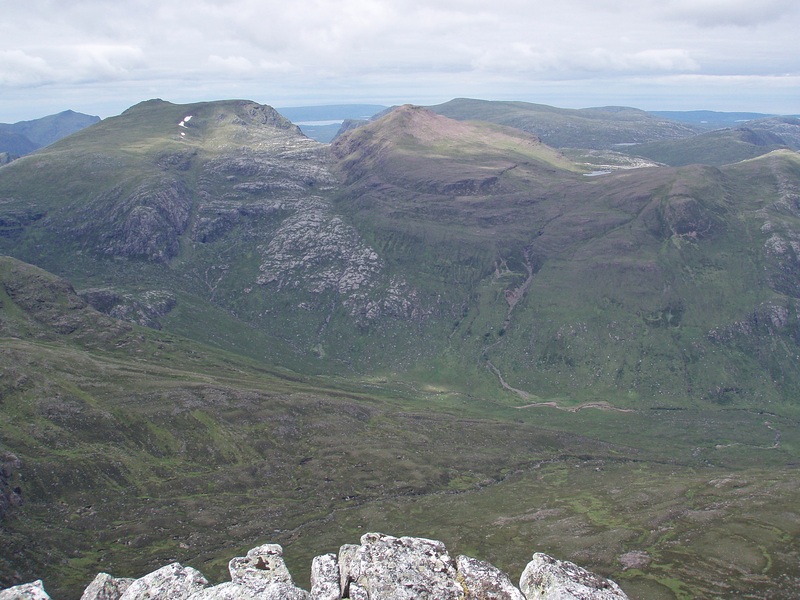 I reached the bealach N of Meall Garbh at 15:45, it had taken me one hour from Mullach Coire Mhic Fhearchair to Sgùrr Dubh and another hour to get to the bealach. 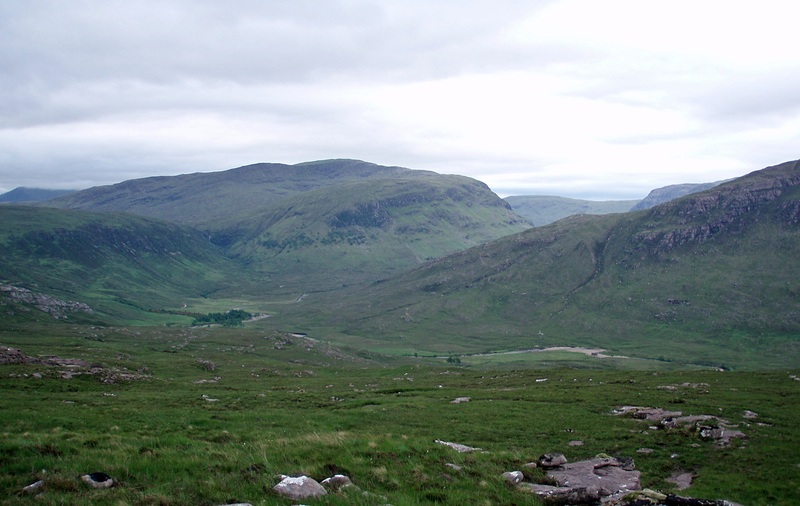 On the clear bypass path around Meall Garbh I made much quicker progress but I realised that I didn’t have enough daylight hours left to complete all five Munros today, and I certainly didn’t want to descend over rough and steep ground into the glen in the dark. 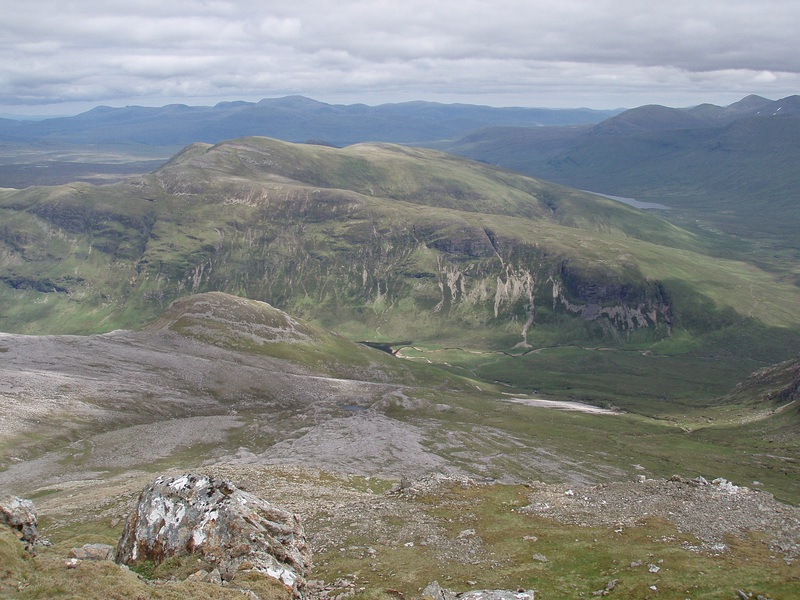 Looking back to Sgùrr Dubh and Meall Garbh. 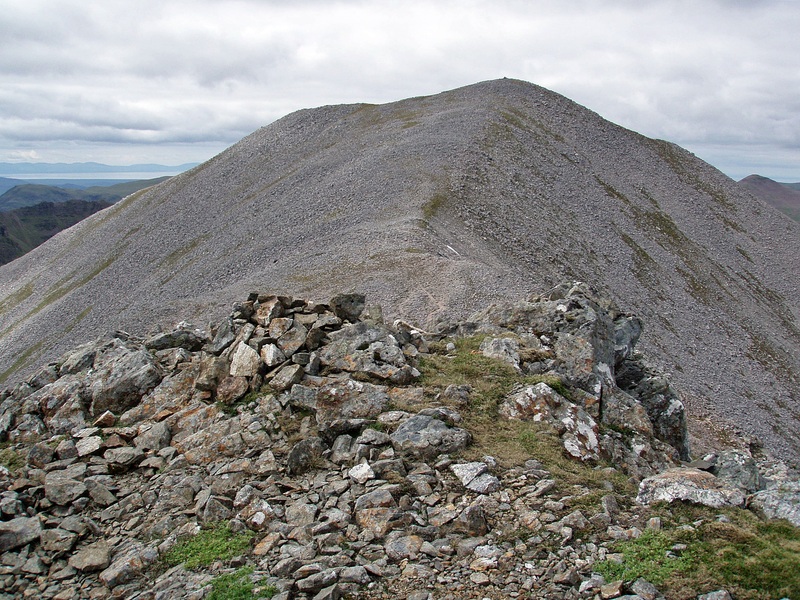 After a food stop on the lower slopes of Beinn Tarsuinn I climbed up the gentle grassy slopes to its summit. 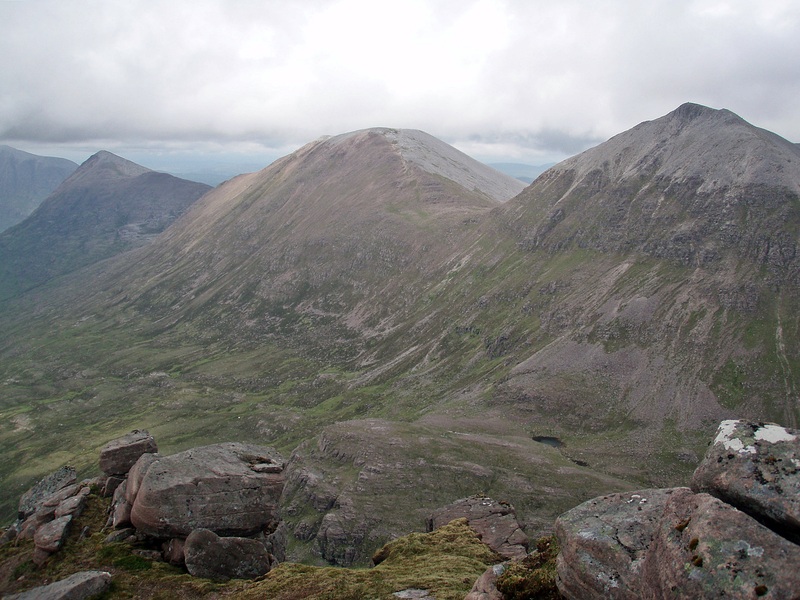 Beinn Tarsuinn’s N ridge with A’ Mhaighdean and Ruadh Stac Mòr in the distance. 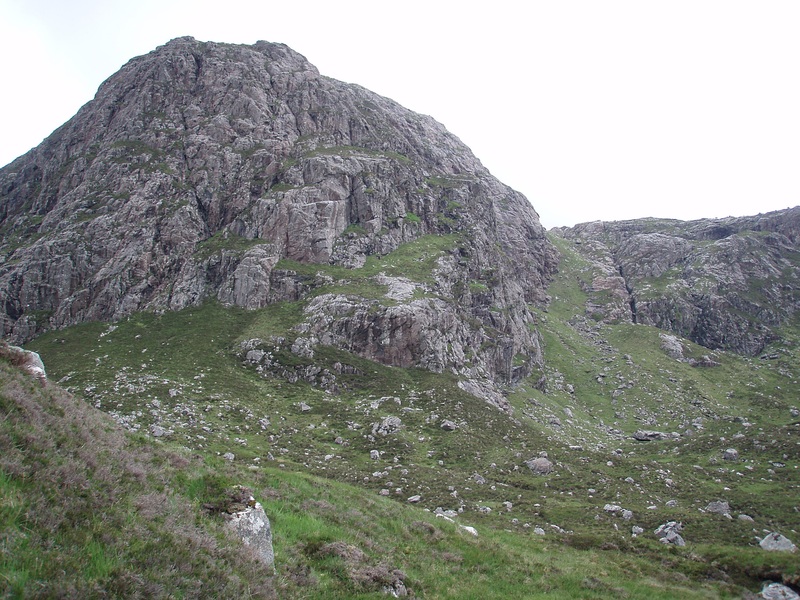 Beinn a’ Chlaidheimh, Sgùrr Bàn and Mullach Coire Mhic Fhearchair. 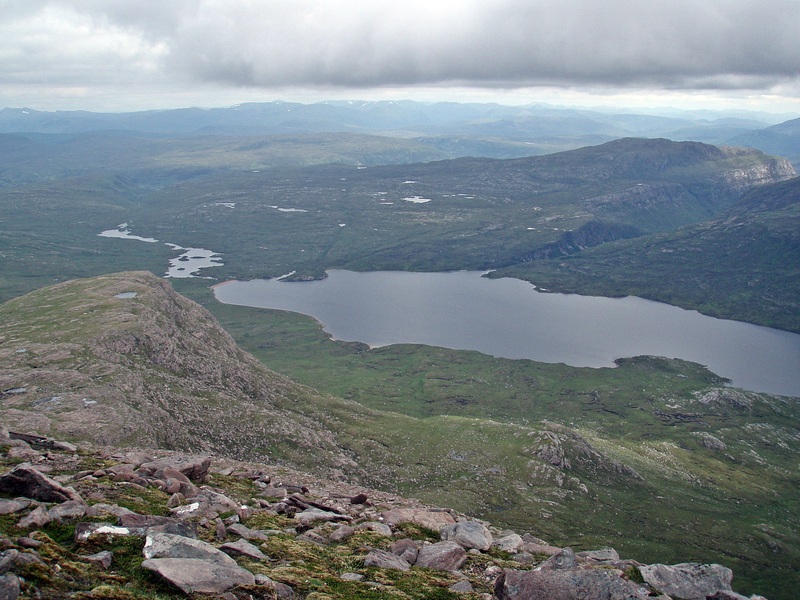 Beinn a’ Mhùinidh and Lochan Fada. 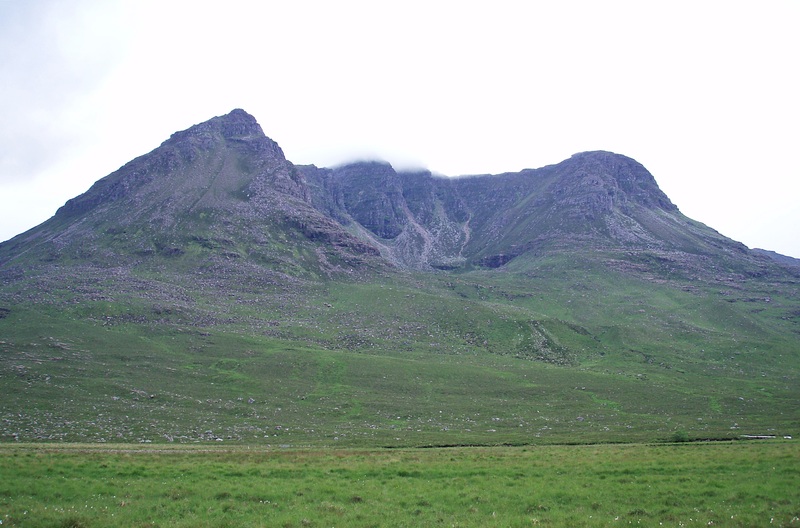 Beinn Làir seen across Lochan Fada. 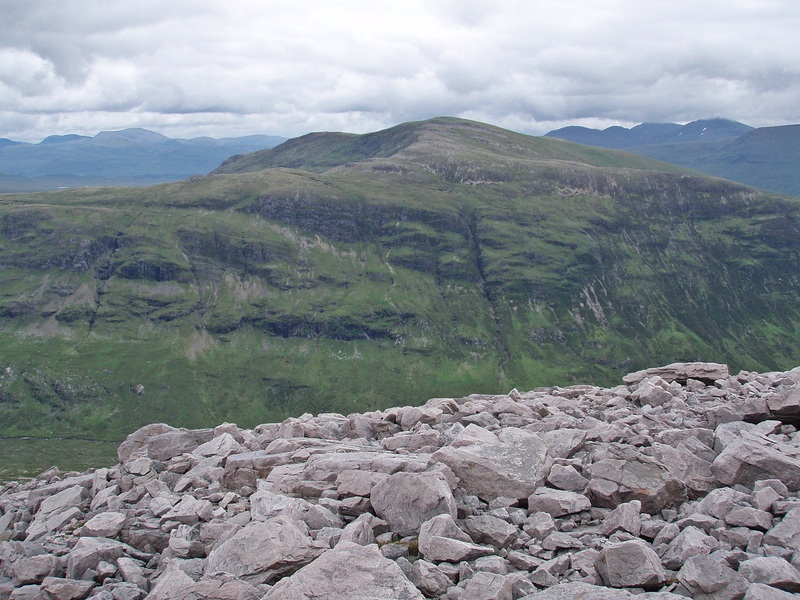 When I reached the slopy plateau on Beinn Tarsuinn known as the Tennis Court, a thick layer of dark clouds had accumulated over the surrounding tops. 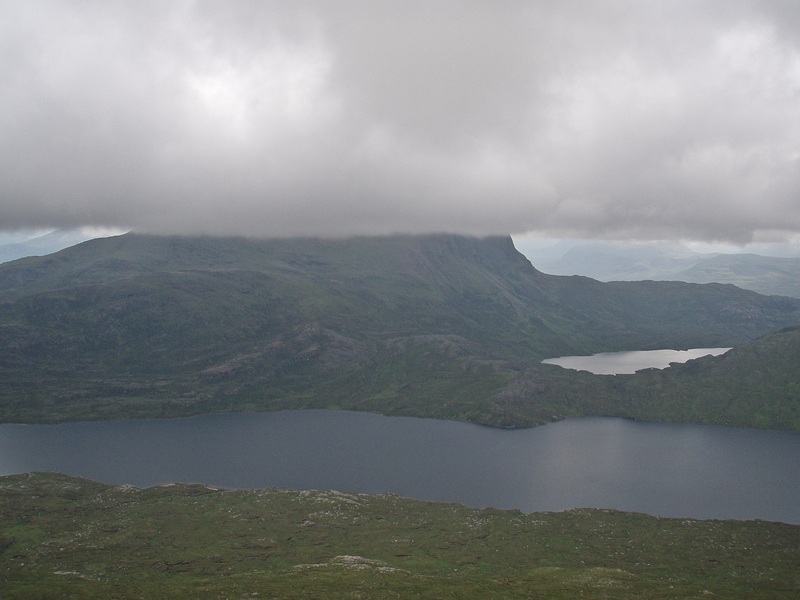 Slioch disappearing in the clouds. 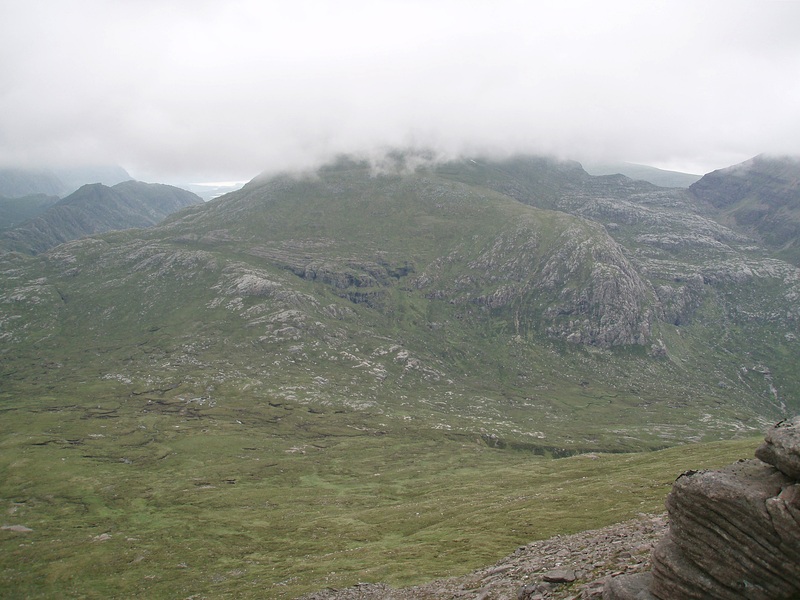 Although I had made my decision already, the lowering clouds only confirmed it – these hills were just too good to be climbed in poor visibility and with no views, so I would leave the remaining two for another time. 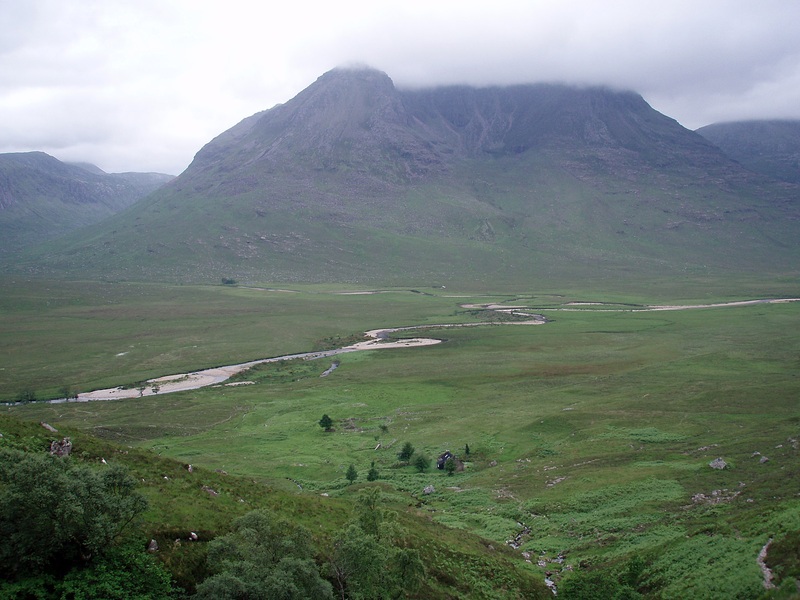 Looking across Pollan na Muice to A’ Mhaighdean. 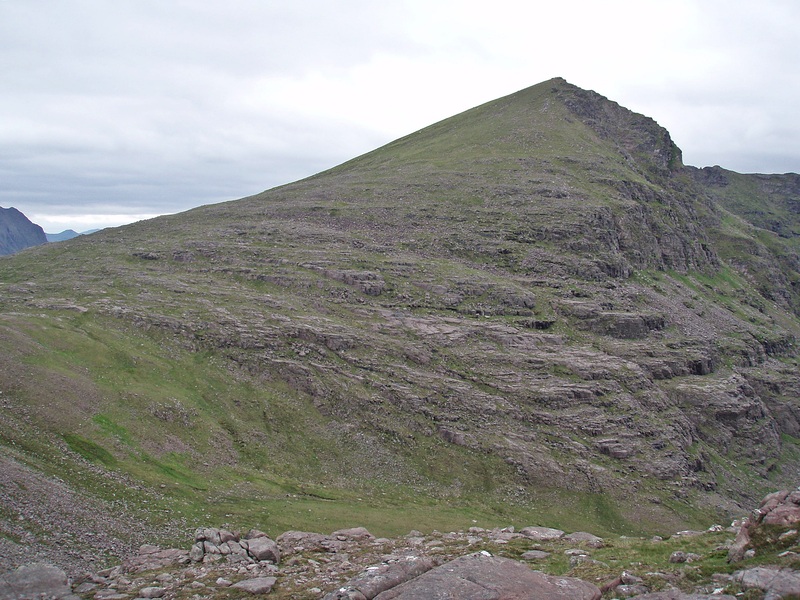 I left Beinn Tarsuinn’s ridge at 18:00 and descended towards Pollan na Muice, then followed the Allt Pollan na Muice all the way into the glen. 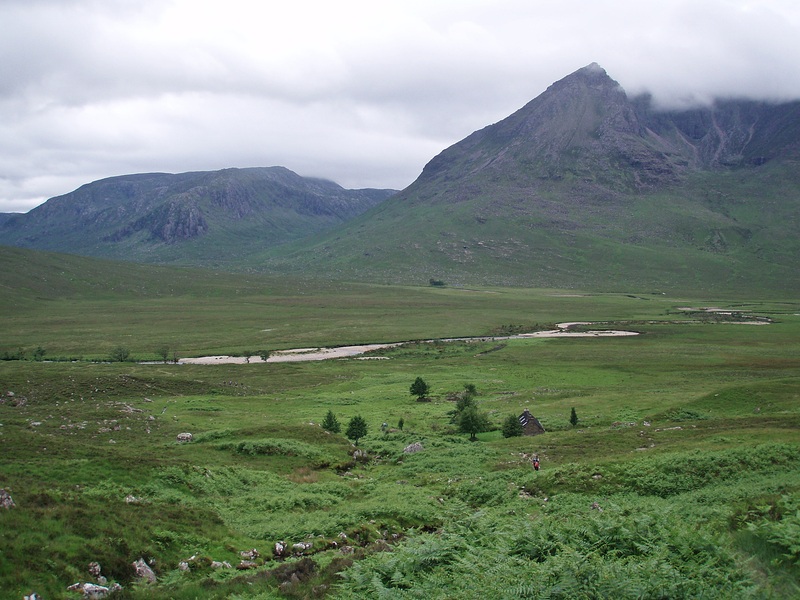 The terrain is grassy with boulders in between, a bit boggy in places but otherwise straightforward. 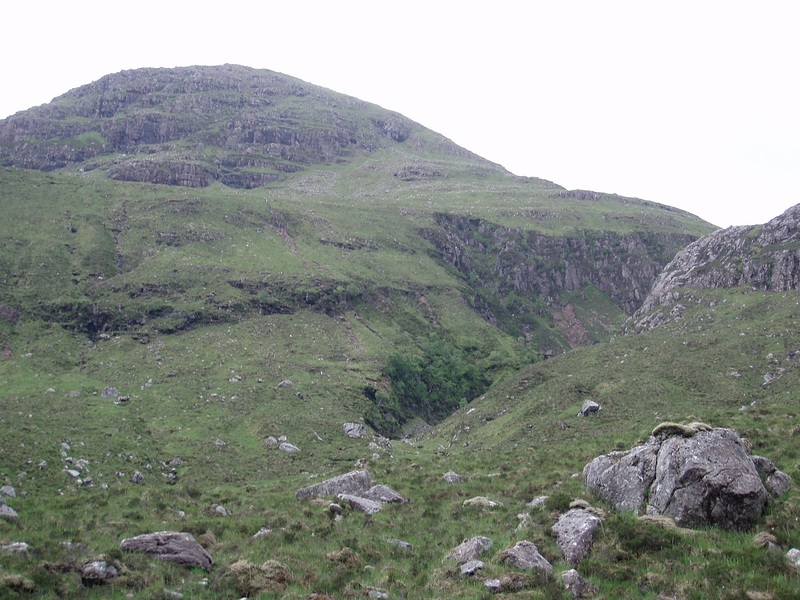 Steep-sided gorge of the Allt an Eas Dheirg. 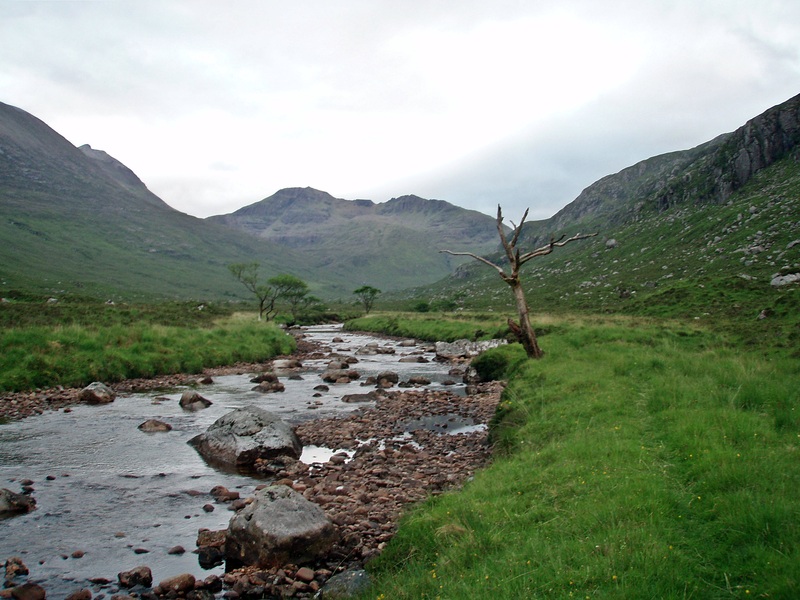 The path on the W bank of the Abhainn Gleann na Muice starts a lot earlier than is marked on the map, and so the rest of the walk along the river was quite enjoyable. 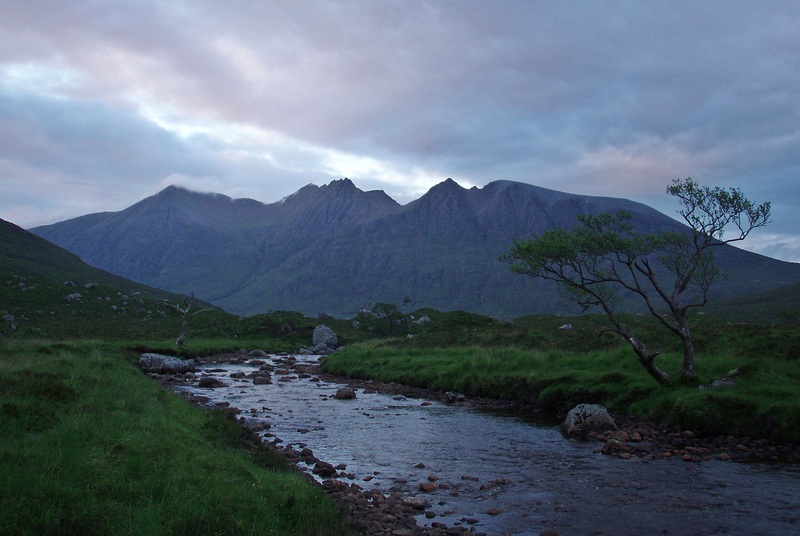 Approaching my camp site, with gloomy An Teallach as a backdrop. 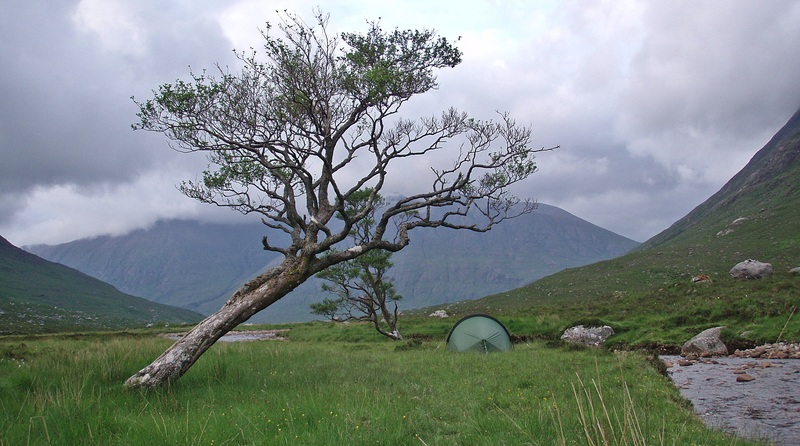 I was glad when I reached my tent at 20:15, so much for my estimated 10 hour walk over five Munros and two Tops! 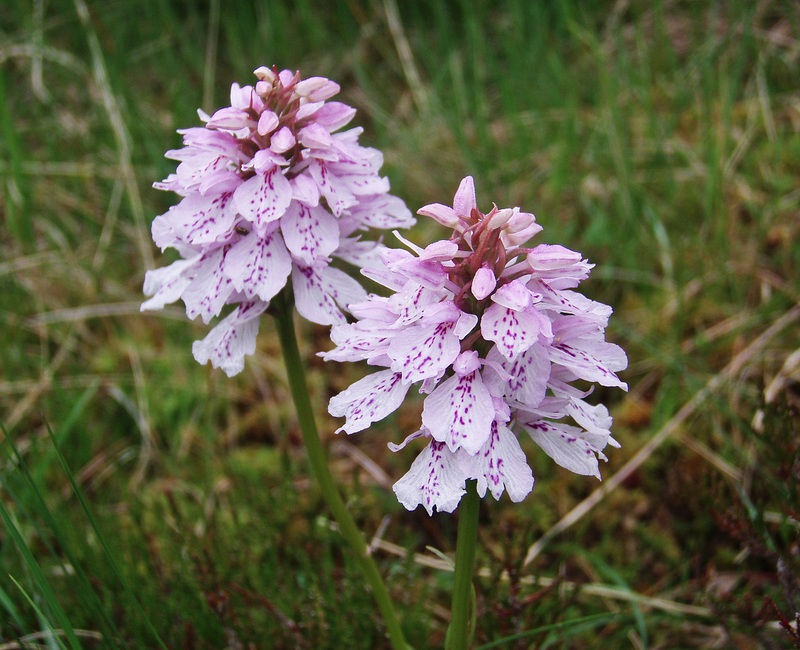 The day started off nice and sunny, and with a light breeze to keep the midges away. After a leisurely breakfast in the sun, sitting on a rock by the river, I took my time with packing and in the end it was almost 12:00 when I left. 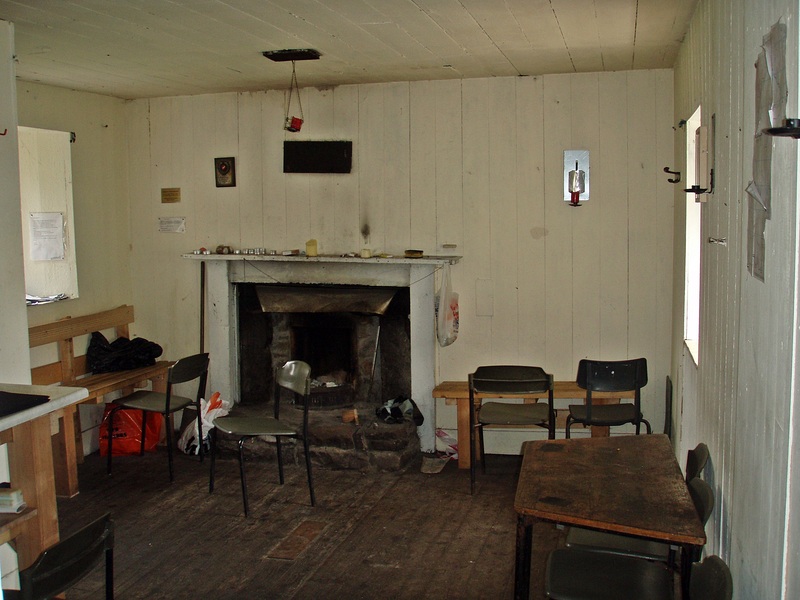 On the way back I stopped at Larachantivore to have a look inside the walkers’ shelter beside the main building. It is tiny and very basic, but as an emergency shelter it probably does what it should. For the return route I tried a different location for the river crossing. 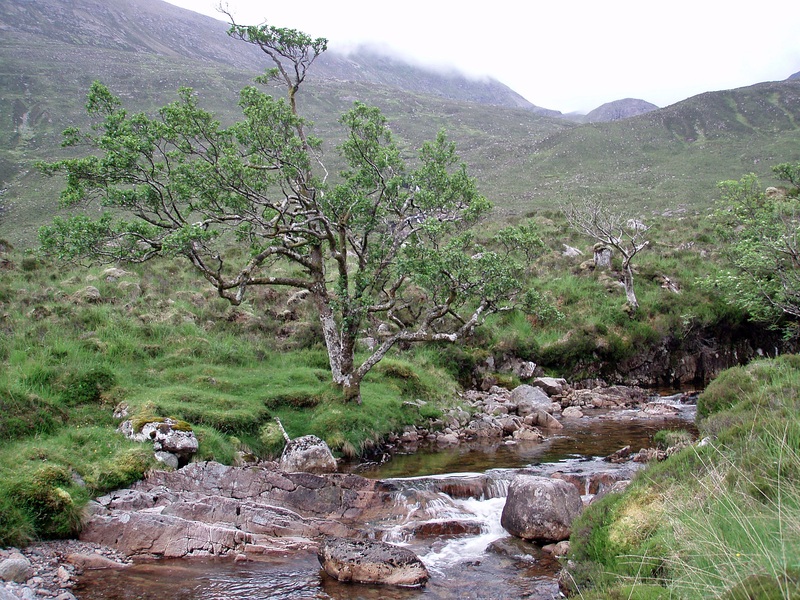 Instead of fording the river at Larachantivore I stayed on the path until I was roughly opposite the confluence of Abhainn Gleann na Muice and Abhainn Srath na Sealga. The river was very shallow at this point and the water only a bit more than ankle-deep. 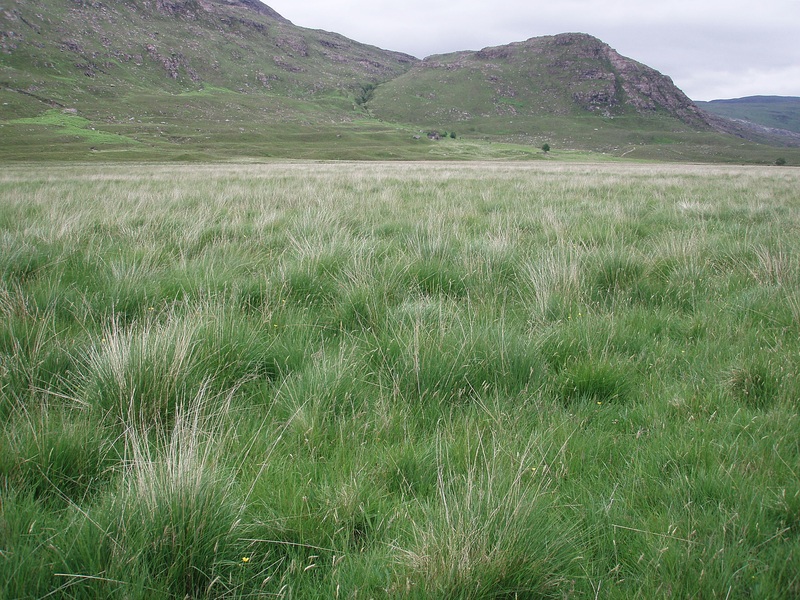 It was a nice surprise to find dry(ish) grass on the other side, at least this terrain was a lot more pleasant than the bog between the two rivers that I had crossed on the way in. Shortly before 14:00 I arrived at Shenavall and sat down under one of the trees for an extended lunch break. I also had a look inside and found quite a few changes since my last stay. An inside wall had been demolished, the main room had been extended and the staircase enclosed with a wall. This room had actually been painted by my friend Dunja who had decided to join the MBA workparty during her holiday in May 2012. 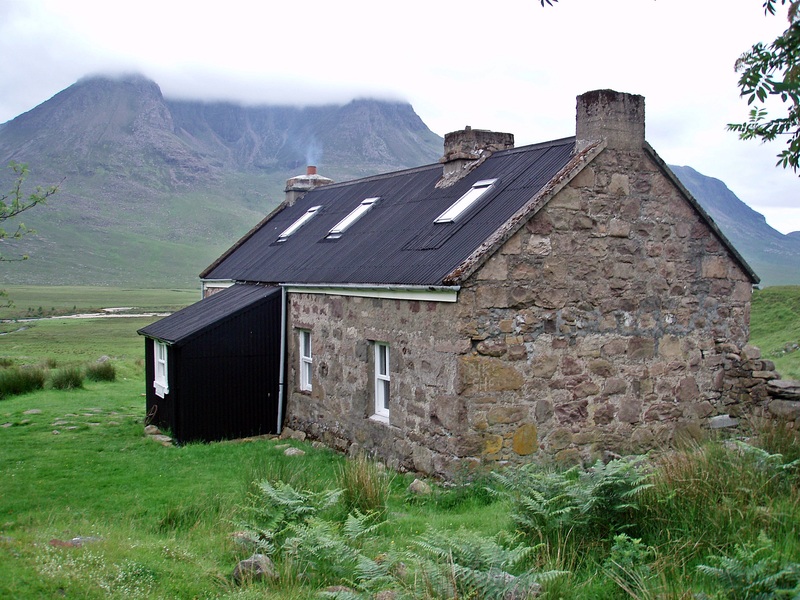 While I was sitting outside the bothy I kept thinking of all the time and effort they had put into this, and what a great job they did! Eventually I got on my way again and had an uneventful walk out back to Corrie Hallie. 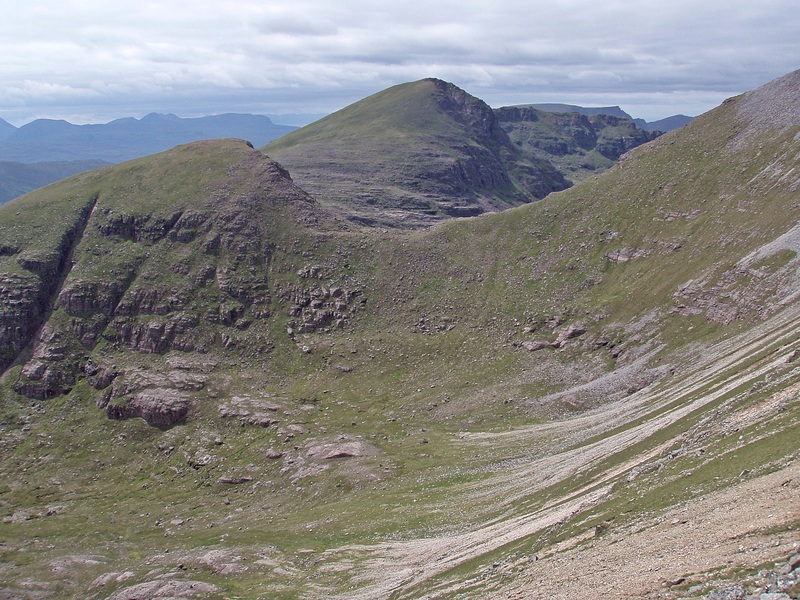 It was a bit disappointing not to be able to do the full round of five Munros, but it was a great walk nonetheless and I am already looking forward to climbing the last two again, A’ Mhaighdean and Ruadh Stac Mòr. 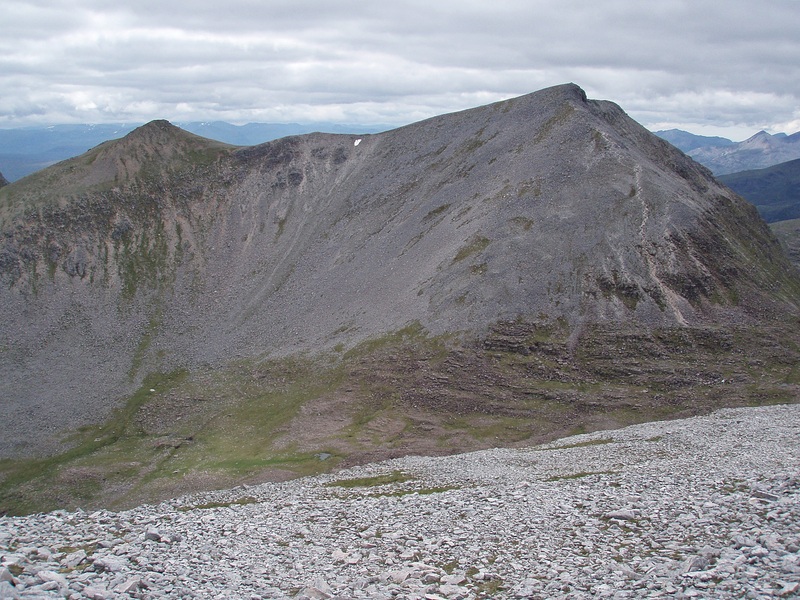 Great close-up photos of Sgurr Dubh – I’m going to tackle it from the other side coming up from Loch a’ Bhraoin – you can just see a nick in one of your early photos which I’m hoping will take me up above the crags which seem to go all around the end of the hill. 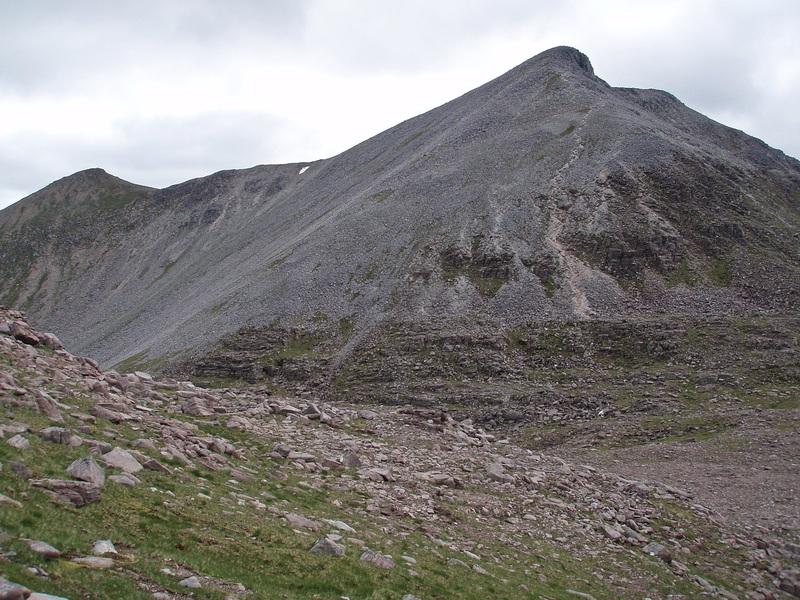 I approached it originally from that side when I did the first top of Mullach Coire Mhic Fhearchair but decided against it as I’m not the bravest scrambler and was on my own. 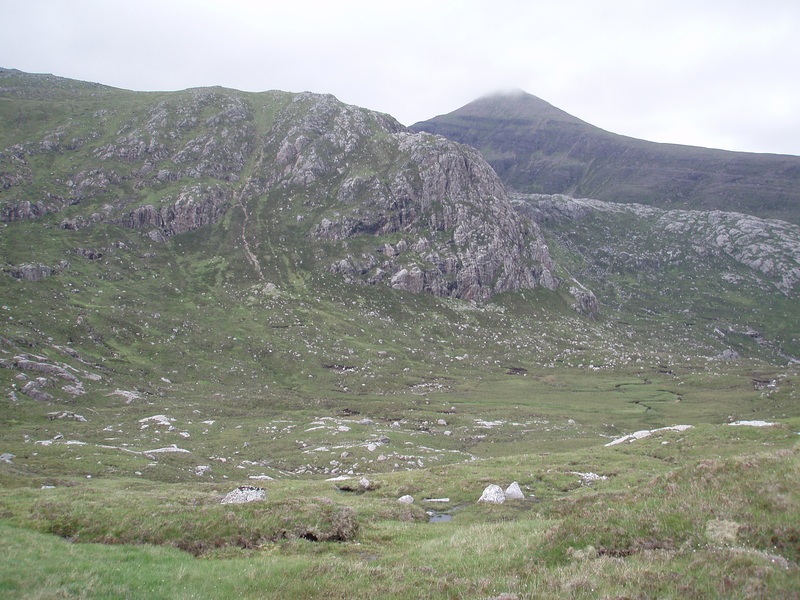 I also tried to contour beneath the Mullach but soon gave it up as it just seemed too bouldery at the height I tried it. 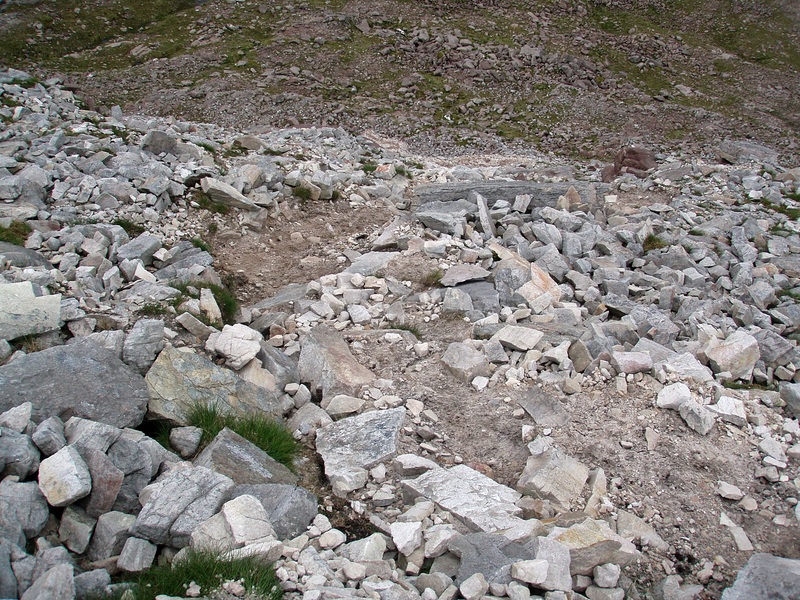 Not sure I’d have fancied that path through the scree which you used anyway. Superb post and really interesting photos. 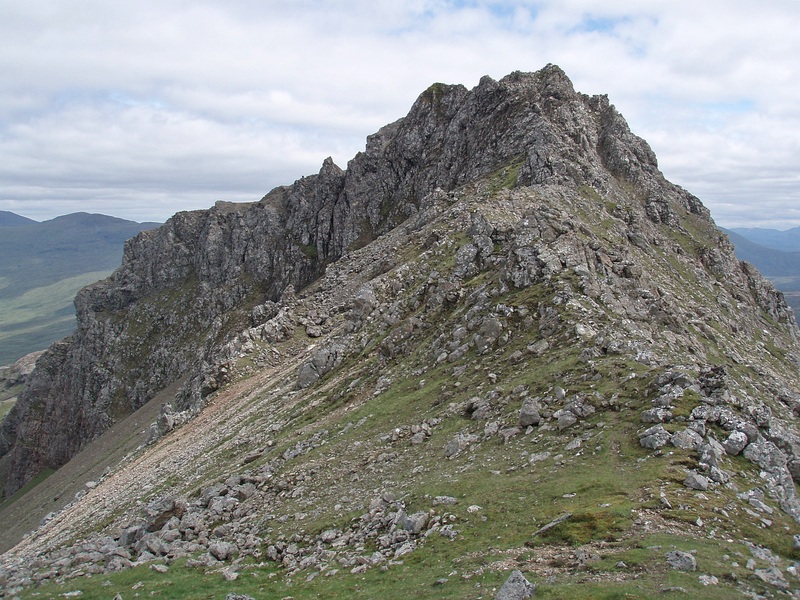 Hope I get Sgurr Dubh done next summer. 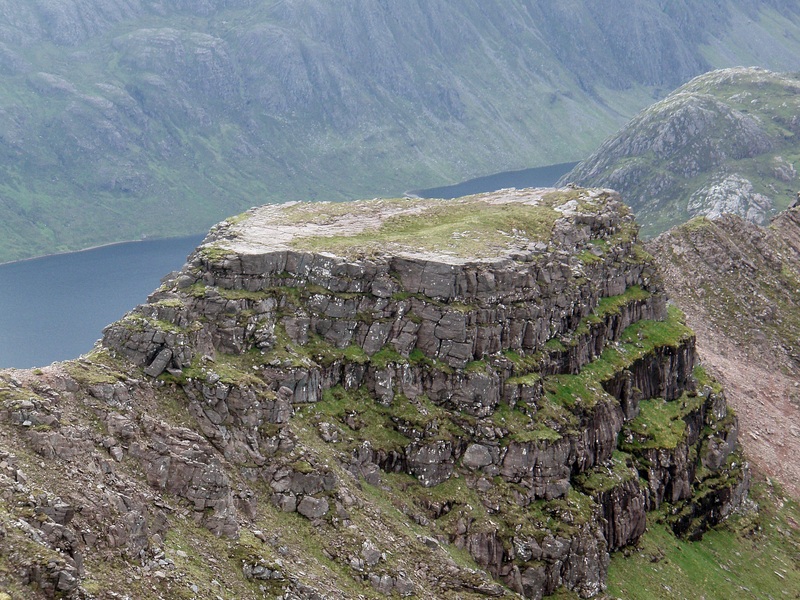 Fingers crossed that you manage Sgurr Dubh soon, it really is a great little summit and a fantastic, airy viewpoint. Thankfully ticks don’t seem to like me, apart from 2011 when I got seven or eight throughout the year I never had any before or after that. 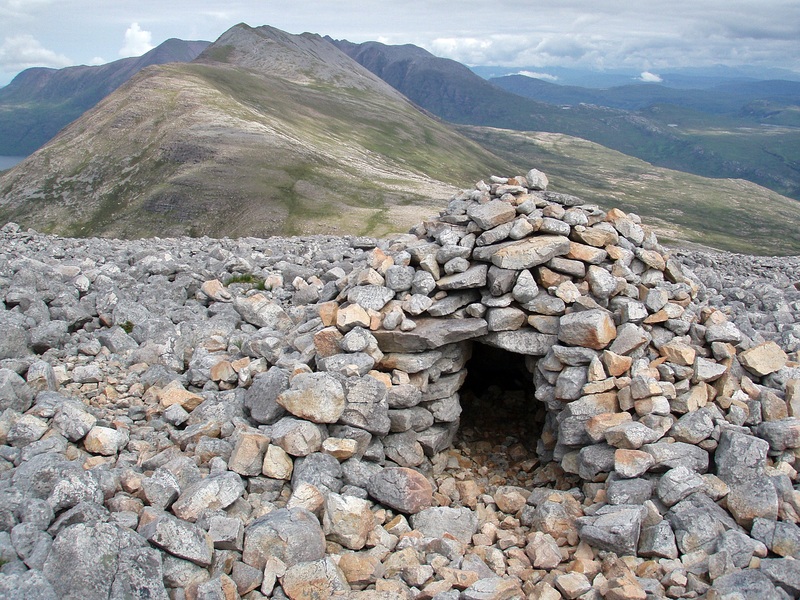 Great post Nicole, and an interesting way to approach Fisherfield. 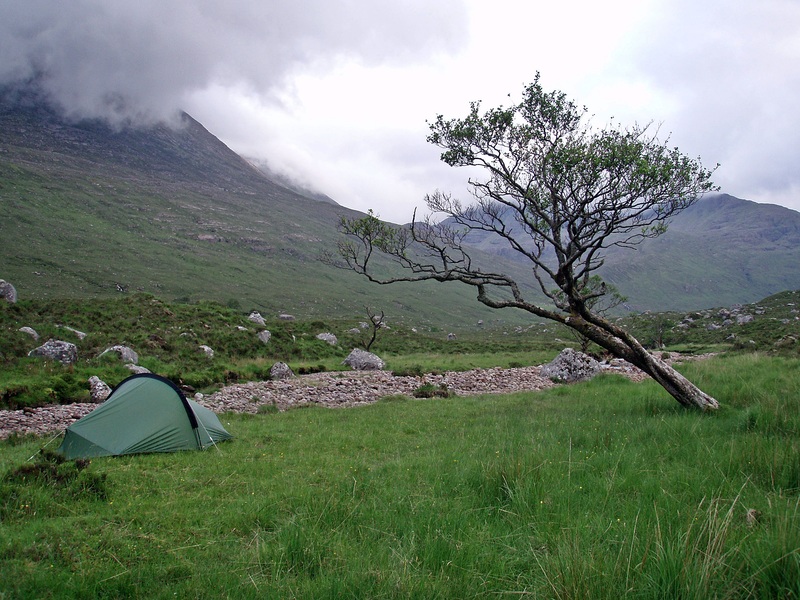 I think you must have camped very close to where I crossed the Abhainn Gleann na Muice on my adventure in Fisherfield a month earlier. 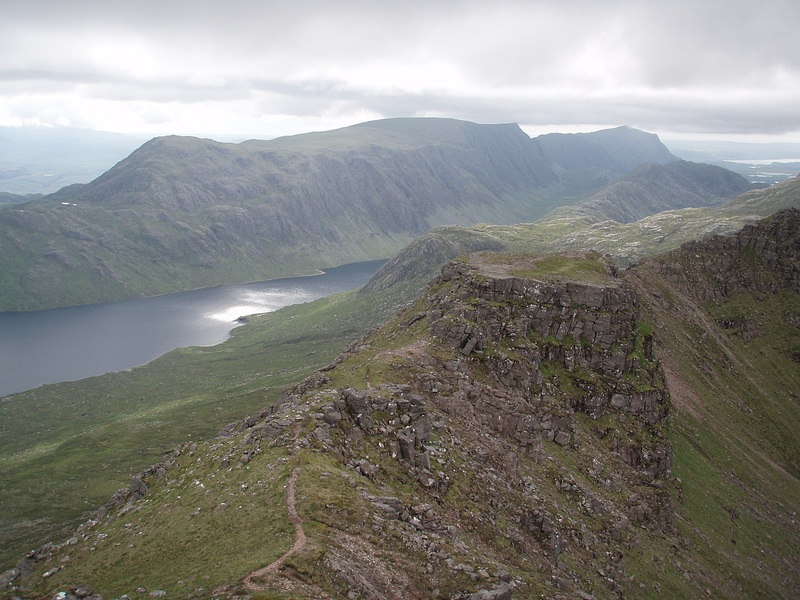 I can sympathise with that pull up to Loch a’ Bhrisidh and then the unending boulder slopes of Sgurr Ban – that whole section took me a long, long time! 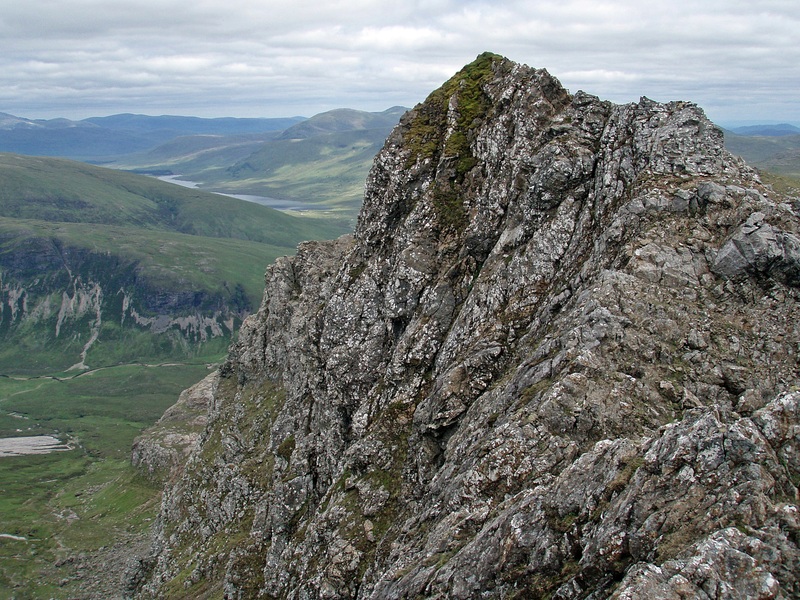 I’m glad to see that Sgurr Dubh isn’t quite as tricky as it looks. 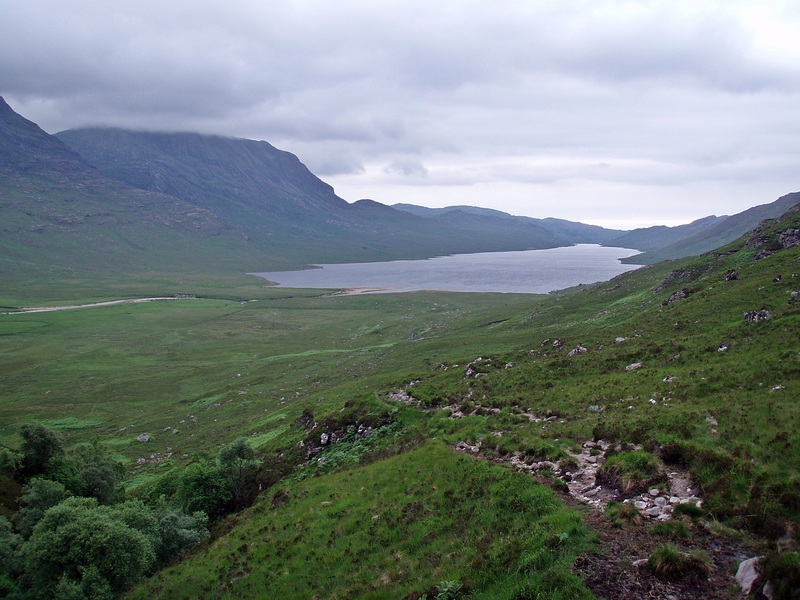 I surveyed it from the east top but decided against going over it with the big pack and instead descended directly to Loch an Nid. Lovely photos throughout. I only just found your trip report (how could I miss that?) and what a fantastic route you walked there! 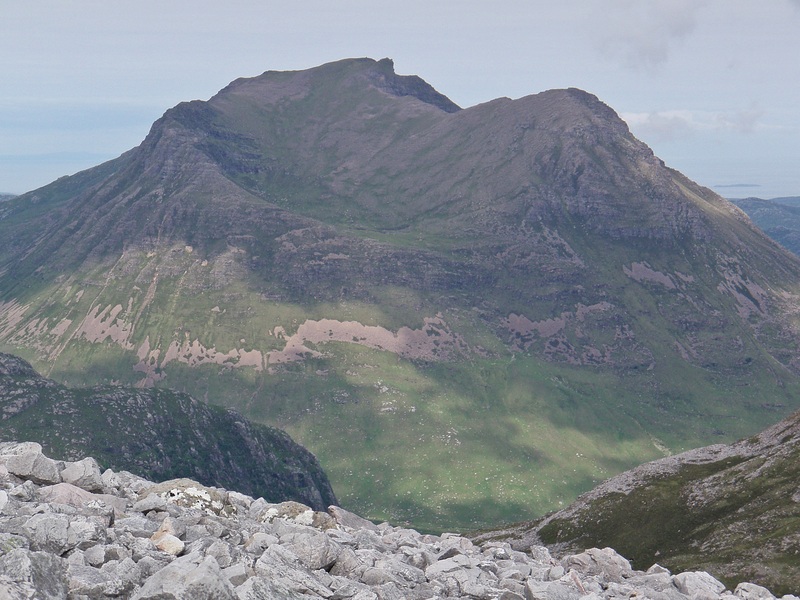 Fisherfield is really one of the most scenic areas in Scotland, and if you are planning the NW ridge of A’ Mhaighdean for your next ascent, it is definitely worth a visit. I’m surprised to hear that the room needed to be repainted after only one year, though? Still, you have all done a great job, thank you very much for the effort! The reason it is magnolia is because Dunja’s white was well done, but was one coat over a lot of dirt. So the next year I saw this big can of white in my garage ( the previous owner was a painter ). 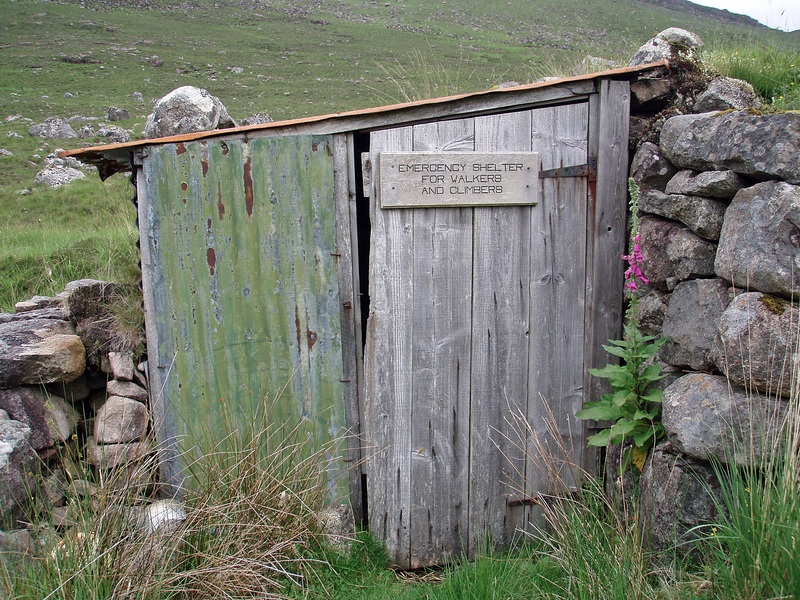 ” This’ll do for the bothy ” I thought, but when we opened it at Shenavall, it was ….magnolia. No chance of popping into B&Q up there, so Moya painted it magnolia. I was so pleased with the effect, that I have since painted The Schoolhouse… magnolia… deliberately. It gives a brighter/warmer feel.